Disclosed is a catalyst for propylene production, which is used for the purpose of producing propylene from one or more materials selected from the group consisting of methanol, dimethyl ether and olefins having 4-8 carbon atoms. The catalyst for propylene production is characterized in that: the catalyst is composed of a binder-less crystalline aluminosilicate molded body having a silicon/aluminum atomic ratio of 500-10,000,and the crystalline aluminosilicate contains an MFI crystal structure and/or an MEL crystal structure. With the use of this catalyst for propylene production, production amounts of aromatic components and paraffin components such as ethylene and propane are reduced, while achieving excellent propylene yield, propylene/propane ratio and catalyst life. 本发明涉及用于从选自甲醇、二甲醚和碳原子数为4〜8的烯烃中的I种或2种以上合成丙烯的由无粘合剂结晶硅酸铝成型体构成的丙烯制造用催化剂，该催化剂的制造方法和使用该催化剂的丙烯的制造方法。  The present invention relates to selected from methanol, dimethyl ether and carbon number 4 to 8 I olefins in two or more kinds of non-adhesive synthetic crystalline aluminosilicate molded body composed of propylene propylene-producing catalyst, the method for producing the catalyst and process for producing propylene using the catalyst. 将结晶硅酸铝作为催化剂使用的从甲醇和/或二甲醚合成丙烯等烯烃的反应众所周知。  from the methanol and / or dimethyl ether synthesis reaction of an olefin such as propylene using crystalline aluminosilicate catalysts, as well known. 非专利文献I记载了在具有MFI型晶体结构的结晶硅酸铝催化剂的存在下从甲醇和二甲醚生成烯烃。 Patent Document I discloses generated from methanol and dimethyl ether in the presence of a crystalline aluminosilicate catalyst having a crystal structure of the MFI-type olefin. 反应效果记载了甲醇和二甲醚的转化率为9. I〜47. 5%，丙烯选择率为26. 7〜48. 2%，生成了乙烯、丁烯、链烷烃、芳香族成分。 The reaction described effect conversion of methanol and dimethyl ether was 9. I~47. 5%, 7~48 propylene selectivity was 26. 2%, the resulting ethylene, butene, paraffin, aromatic component. 专利文献I公开了如下方法：在催化剂中使用具有至少10的硅/铝原子比（以下，在本发明的说明书中记述为Si/Al比）的五元环（Pentasil)型结晶硅酸铝，从甲醇和/或二甲醚制造烯烃时，以10〜90kPa的总压、O. I〜I. 5的水/甲醇的重量比进行。  Patent Document I discloses a method: using the catalyst having a silicon of at least 10 / aluminum atomic ratio (hereinafter referred to as Si / Al ratio in the description of the present invention) a five-membered ring (pentasil) type crystalline silicon , aluminum, the production of olefins from methanol and / or dimethyl ether to a total pressure 10~90kPa, O. I~I. 5 water / methanol weight ratio. 记载了虽然通过该方法，可以得到至少5重量％的乙烯、至少35重量％的丙烯和最高30重量％的丁烯，但在常压下，烯烃收率低，副产很多链烷烃成分和汽油等芳香族成分。 Although this method is described, it is possible to obtain at least 5% by weight of ethylene, at least 35 wt% of propylene and up to 30 wt% of butenes, but under normal pressure, the olefin yield is low, a lot of by-product gasoline and paraffin fraction aromatic components. 另外，五元环型是指具有MFI型、MEL型、MOR型等五元环结构的沸石。 Further, it means pentasil type zeolite having an MFI, MEL type, MOR type or the like of the five-membered ring structure. S卩，在以结晶硅酸铝作为催化剂使用的从甲醇和/或二甲醚的丙烯合成反应中，在目标的丙烯以外，还副产乙烯、丁烯等烯烃、甲烷、乙烷、丙烷、丁烷等链烷烃、芳香族成分。  S Jie, the synthesis reaction of propylene from methanol and / or dimethyl ether, propylene outside the target, further by-product ethylene, butene olefins, methane, ethane crystalline aluminosilicate to be used as a catalyst , propane, butane and other paraffins, aromatic component. 根据非专利文献2，记载了在催化剂中使用结晶硅酸铝，在丙烯以外的产物中，丁烯等碳原子数为4以上的烯烃能够转化为丙烯。  The Patent Document 2 discloses the use of crystalline aluminosilicate in the catalyst, the product other than propylene, butene number of 4 or more carbon atoms can be converted to the olefin is propylene. 因此，丁烯等碳原子数为4以上的烯烃在从甲醇和/或二甲醚合成丙烯的反应器中再循环，能够转化为丙烯。 Thus, the number of carbon atoms, butene, 4 or more olefin recycled from the methanol and / or dimethyl ether synthesis reactor propylene, can be converted into propylene. 另一方面，因为相比于碳原子数为4以上的烯烃，甲烷、乙烷、丙烷、丁烷等链烷烃与乙烯的反应性低，所以即使在从甲醇和/或二甲醚合成丙烯的反应器中再循环，也几乎不能转化为丙烯。 On the other hand, as compared to the number of carbon atoms is 4 or more olefins, methane, ethane, propane, butane and other paraffins and ethylene reactivity is low, even in the methanol and / or dimethyl ether synthesis propylene recycle reactor, it can hardly be converted to propylene. 另外，因为丙烷和丙烯沸点相近，所以丙烷生成量越多，精馏塔所需要的塔板数越增加，有耗费精制能量成本的缺点。 Further, since the close-boiling propane and propylene, so the more the amount of propane, the number of plates required rectification column is increased, the cost disadvantages of refining energy costs. 还已知芳香族成分会转化成作为堵塞结晶硅酸铝的细孔且导致催化剂性能下降的原因的焦炭。 It is also known as aromatic component will be transformed into crystalline aluminosilicate clogging the pores of the catalyst and leads to coke cause performance degradation. 在非专利文献3中说明了乙烯通过从芳香族化合物的消去反应生成。 Description of ethylene to elimination reaction from an aromatic compound by Non-Patent Document 3. 因此，为了从甲醇和/或二甲醚合成丙烯，优选乙烯、链烷烃、芳香族化合物生成量少的催化剂，特别希望开发乙烯、丙烷生成量少的催化剂。  Accordingly, in order to generate a small amount of the catalyst from the methanol and / or dimethyl ether synthesis of propylene, preferably ethylene, paraffins, aromatics, particularly desirable to develop ethylene, propane to generate a small amount of catalyst. 一般而言，结晶硅酸铝通过在原料中使用包含硅化合物、铝化合物、碱金属化合物和四丙基氢氧化铵等结构导向剂的水性反应浆料，被水热合成为I微米左右粒径的粉末。  In general, by using a crystalline aluminosilicate in an aqueous feedstock comprising a silicon compound, aluminum compound, an alkali metal compound and tetrapropyl ammonium hydroxide in the reaction slurry structure directing agent, the hydrothermal synthesis to be I m powder particle size of about. 因此，作为固定床催化剂使用时，需要加工为5mm左右的成型体，作为流动层催化剂使用时，必须加工为50〜100微米的二次颗粒成型体。 Thus, when used as a fixed bed catalyst, the need for processing to molded about 5mm, when used as a fluidized bed catalyst must be processed to shaped bodies of secondary particles 50~100 microns. 此时，一般使用粘土或氧化铝等粘合剂进行成型加工。 In this case, like clay or aluminum oxide is generally used for forming an adhesive. 作为实质上不含粘合剂成分的结晶娃酸招成型体，已知有以DryGel Conversion法(干凝胶转化法）（以下，在本说明书中记述为DGC法)合成的成型体。  As the binder component is substantially free of crystalline molded doll move acid, are known to DryGel Conversion method (dry gel conversion method) (hereinafter, described in the present specification is a method DGC) molded synthetic . 专利文献2公开了从包含铵离子或胺类结晶化调整剂(结构导向剂)、二氧化硅（SiO2)成分、和铝盐的碱性的无机材料混合液中析出的固体成分制造结晶性微多孔体的方法。 Patent Document 2 discloses an ammonium ion or an amine containing from crystallization modifier (structure directing agent), silica (SiO2) component, a mixture of aluminum salt and a basic inorganic material in the solid component precipitated producing micro-crystalline the method of the porous body. 另外，专利文献3公开了无粘合剂MFI型结晶硅酸铝成型体、和包含无粘合剂MFI型结晶硅酸铝成型体的氨基化反应用催化剂，在该成型体中，无粘合剂结晶硅酸铝中所包含的晶格外的铝含量为该成型体中所包含的全部铝的3%以下。  Further, Patent Document 3 discloses a binderless MFI-type crystalline aluminosilicate molded body, and comprising a binderless MFI-type crystalline aluminosilicate molded amination reaction catalyst in the shaped body, crystal binderless crystalline aluminosilicate contained in the extra 3% aluminum content for the molded body contained in total aluminum less. 本发明的发明者们在原料中使用包含硅化合物、铝化合物、碱金属化合物和四丙基氢氧化铵的水性反应浆料，水热合成Si/Al比为500的结晶硅酸铝粉末，使用氧化铝等粘合剂进行成型而制造催化剂。  The inventors of the present invention is used in the feedstock comprising a silicon compound, aluminum compound, an alkali metal compound and tetrapropyl ammonium hydroxide aqueous reaction slurry, hydrothermal synthesis Si / Al ratio of the crystalline aluminosilicate 500 powder, a binder such as alumina catalyst manufactured by molding. 并且，本发明的发明者们使用该催化剂尝试了从甲醇和/或二甲醚合成丙烯的反应。 Further, the present inventors attempted using the catalyst from the reaction of methanol and / or dimethyl ether synthesis propylene. 但是，丙烯收率低，副产大量乙烯、丙烷等链烷烃成分、芳香族成分。 However, a large number of paraffin components ethylene, propane, propene low yield byproduct, aromatic component. 另外，结晶硅酸铝粉末的合成效率也差，作为实用催化剂不能令人满意。 Further, a synthetic crystalline aluminosilicate powder efficiency is poor, unsatisfactory as a practical catalyst. S卩，本发明的课题在于提供一种丙烯制造用催化剂、该催化剂的制造方法和使用该催化剂的丙烯制造方法，该催化剂在从甲醇和/或二甲醚合成丙烯的反应中，乙烯、丙烷等链烷烃成分、芳香族成分的生成量少，丙烯收率、丙烯/丙烷比、催化剂寿命优异。  S Jie, object of the present invention is to provide a catalyst for propylene production method for producing the catalyst and a method for producing the propylene using the catalyst, the catalyst from the reaction of methanol and / or dimethyl ether synthesis propylene, paraffin component comprising ethylene, propane, etc., generated in a small yield of propylene, propylene / propane ratio, excellent catalyst life aromatic component. 本发明的发明者们关于上述课题深入研究的结果，发现由Si/Al比在500〜10000范围内的无粘合剂结晶硅酸铝成型体构成的催化剂，为丙烯收率、丙烯/丙烷比、催化剂寿命优异的丙烯制造用催化剂，从而完成了本发明。  Results of the inventors of the present invention, the above object of intensive studies, found that the shaped catalyst body is composed of a binderless aluminosilicate crystalline Si / Al ratio in the range of 500~10000, propylene yield, propylene / propane ratio, excellent catalyst life catalyst for propylene production, thereby completing the present invention. (I) 一种丙烯制造用催化剂，其特征在于：其用于从选自甲醇、二甲醚和碳原子数为4〜8烯烃中的I种或2种以上制造丙烯，该催化剂由硅/铝原子比为500〜10000的无粘合剂结晶硅酸铝成型体构成，结晶硅酸铝包含MFI型的晶体结构和/或MEL型的晶体结构。  (I) a propylene producing catalyst, wherein: for from methanol and dimethyl ether, and the number of carbon atoms selected from Type I olefins of 4 to 8 or more kinds of manufacturing propylene, the catalyst silicon / aluminum atomic ratio of 500~10000 binderless crystalline aluminosilicate molded configuration comprising a crystalline aluminosilicate of the MFI type crystal structure and / or MEL type crystal structure. (2)在（I)中记载的丙烯制造用催化剂，其特征在于：通过红外分光分析，在从3715cm-1至3735cm—1的范围内所观察到的无粘合剂结晶硅酸铝成型体的羟基的峰位置在3725cm-1 至3735cm-1 的范围内。  (2) in the propylene production (I) described in the catalyst, wherein: By infrared spectroscopic analysis, the adhesive-free crystallization observed in the range of from 3715cm-1 to 3735cm-1 to silicate peak position hydroxy aluminum body is molded in the range of 3725cm-1 to 3735cm-1 is. (3)在（I)或（2)中记载的丙烯制造用催化剂，其中，结晶硅酸铝为MFI型晶体结构和/或MEL型晶体结构的。  (3) in (I) or (2) for producing propylene described catalyst, wherein the crystalline aluminosilicate is an MFI type crystal structure and / or MEL type crystal structure. (4)在（I)〜（3)中任一项记载的丙烯制造用催化剂，其中，结晶硅酸铝的阳离子型为质子型或铵离子型。  (4) propylene production in formula (I) through (3) described a catalyst, wherein the crystalline aluminosilicate is a proton type cationic type or an ammonium ion. (5) 一种制造丙烯的方法，其中，在（I)〜（4)中任一项记载的丙烯制造用催化剂存在下，从选自甲醇、二甲醚和碳原子数为4〜8烯烃中的I种或2种以上制造丙烯。  (5) A method for producing propylene, wherein the propylene production in the formula (I) through (4) described by a presence of a catalyst, from dimethyl ether and the number of carbon atoms is selected from methanol 4 I ~ 8 olefins or two or more kinds of the production of propylene. (6) 一种丙烯制造用催化剂的制造方法，其特征在于：该丙烯制造用催化剂由硅/铝原子比为500〜10000的无粘合剂结晶硅酸铝成型体构成，结晶硅酸铝包含MFI型的晶体结构和/或MEL型的晶体结构，该制造方法包括转化工序，其中，使由包含硅成分、铝成分和结构导向剂成分的固体成分构成的原料成型体接触包含饱和水蒸气的气氛，将硅成分和铝成分转化为结晶硅酸铝。  (6) A propylene production, characterized in that the method for producing a catalyst: The catalyst for producing propylene from a silicon / aluminum atomic ratio of the crystalline aluminosilicate 500~10000 binderless molded configuration, the crystalline acid aluminum containing MFI type crystal structure and / or MEL type crystal structure, the method including the conversion step, wherein the the comprising the silicon component, the molded body is in contact with the raw material solid matter aluminum component and directing agent component structure composed of a saturated water vapor atmosphere, the silicon component and the aluminum component to crystalline aluminosilicate. (7)在（6)中记载的丙烯制造用催化剂的制造方法，包括烧制工序，其中，在碱金属存在下，对上述转化工序中得到的转化产物进行烧制。  (7) In the propylene production (6) by the method described for producing a catalyst, comprising a step of firing, wherein, in the presence of an alkali metal, conversion of the product obtained in the above-described conversion step is fired. (8)在（7)中记载的丙烯制造用催化剂的制造方法，其中，在上述烧制工序中，在碱金属/铝原子比为4〜200范围内的碱金属的存在下，对上述转化产物进行烧制。  (8) in the propylene (7) The method for manufacturing according to the catalyst, wherein, in the firing step, the alkali metal / aluminum atomic ratio of presence of alkali metal in the range of 4~200, firing the above-described conversion products. 根据本发明，就能够得到如下的丙烯制造用催化剂，其在从选自甲醇、二甲醚和碳原子数为4〜8烯烃中的I种或2种以上合成丙烯的反应中，乙烯、和丙烷等链烷烃成分的生成量少，丙烯收率、丙烯/丙烷比、催化剂寿命优异。  According to the present invention, propylene can be obtained as follows for producing the catalyst, which is selected from methanol, dimethyl ether and 4 to 8 carbon atoms in the I-olefin or two or more kinds in the synthesis reaction of propylene, generating less, the yield of propylene, propylene / propane ratio, excellent catalyst life ethylene chain paraffin components, and propane. 另外，因为将在上述丙烯合成反应中副产的碳原子数为4〜8的烯烃在丙烯合成反应器中再循环，能够转化为丙烯，所以能够提供在从甲醇和/或二甲醚制造丙烯时丙烯收率高的工艺。 Further, since the number in the propylene synthesis reaction byproduct is 4 to 8 carbon atoms in the propylene recycle olefin synthesis reactor, can be converted into propylene, propylene can be provided during the manufacturing from methanol and / or dimethyl ether propylene yield of the process. 本发明的丙烯制造用催化剂，其特征在于，由硅/铝原子比为500〜10000的无粘合剂结晶硅酸铝成型体构成，结晶硅酸铝包含MFI型的晶体结构和/或MEL型的晶体结构。  The propylene production catalyst of the present invention, wherein the silicon / aluminum atomic ratio 500~10000 binderless crystalline aluminosilicate molded configuration comprising a crystalline aluminosilicate of the MFI type crystal structure and / or MEL type crystal structure. 结晶硅酸铝是指结晶质的铝硅酸盐分子筛，是以硅原子为中心、4个氧原子在其顶点配置的SiO4四面体，和以铝原子为中心、4个氧原子在其顶点配置的AlO4四面体，以氧/(硅+铝)的原子比为2的方式相互共有氧原子且三维地具有规则性而结合的化合物。  The crystalline aluminosilicate refers to a crystalline aluminosilicate zeolite, a silicon atom is centered, 4 oxygen atoms arranged in a tetrahedral SiO4 its apex, and the center of aluminum atom and four oxygen atoms AlO4 tetrahedron whose apex configuration, the compound of embodiment 2 oxygen atoms and shared with each other three-dimensionally bound regularity and oxygen / (Al + Si) atomic ratio. 结晶硅酸铝的结构，根据上述SiO4四面体和AlO4四面体的结合方式不同，已知有细孔的大小、形状不同的多种结构。 Crystalline aluminosilicate structure, based on the binding mode and AlO4 tetrahedra SiO4 tetrahedra different pore size are known, a variety of structures of different shapes. 结晶娃酸招的结构由国际沸石学会（IZA international ZeoliteAssociation)以分别表示晶体结构的3文字的代号进行分类。 Acid baby move crystalline structure by the International Zeolite Association (IZA international ZeoliteAssociation) 3 respectively represent character code crystal structure classified. 即，本发明的丙烯制造用催化剂由包含结晶硅酸铝的无粘合剂结晶硅酸铝成型体构成，该结晶硅酸铝包含以国际沸石学会规定的表示结晶分子筛的晶体结构的3文字代号被分类为MFI型的晶体结构和/或MEL型的晶体结构的结构。 That is, according to the present invention, the propylene production catalyst comprising a crystalline aluminosilicate of binderless crystalline aluminosilicate molded configuration, the crystalline aluminosilicate comprises three letter codes to indicate the crystalline molecular sieve defined by the International Zeolite Association crystal structure MFI-type structure are classified into crystal structure and / or MEL type crystal structure. MFI型晶体结构也称为ZSM-5型晶体结构、MEL型晶体结构也称为ZSM-Il型晶体结构。 MFI-type crystal structure is called the crystal structure of ZSM-5 type, MEL type crystal structure are also referred to as ZSM-Il type crystal structure. MFI型晶体结构和MEL型晶体结构都具有5A左右的细孔，因为构成结晶的二级结构单元（Secondary Building Unit)相同,所以根据结晶娃酸招的制造条件,有时MFI型晶体结构和MEL型晶体结构在I个结晶颗粒中同时存在(共生：intergrowth)。  MFI type MEL type crystal structure and crystal structure have pores of about 5A, since the crystals constituting the secondary structural elements (Secondary Building Unit) the same, so the manufacturing condition of crystal baby acid strokes, sometimes MFI-type crystal structure MEL type crystal structure and the crystal grains in the I exist (symbiosis: intergrowth). 在本发明的丙烯制造用催化剂中，所谓MFI型的晶体结构和/或MEL型的晶体结构，包含MFI型晶体结构和MEL型晶体结构共生的形态。 In the propylene production catalyst of the present invention, the term MFI type crystal structure and / or MEL type crystal structure, the crystal structure of the MFI type and MEL type crystal structure coexist form. 结晶硅酸铝因为铝原子处于中心的AlO4四面体的化合价为负，所以通过与质子、铵离子、碱金属离子、碱土金属离子、稀土金属离子等阳离子结合而成为电中性。  Since aluminum atoms in the crystalline aluminosilicate valence AlO4 tetrahedron center is negative, becomes electrically neutral by binding a proton, an ammonium ion, alkali metal ions, alkaline earth metal ions, rare earth metal ions. 这样的阳离子在结晶硅酸铝的细孔内存在，显示催化作用。 Such pore crystalline aluminosilicate cation memory, display catalysis. 在本发明的丙烯制造用催化剂中，无粘合剂结晶硅酸铝成型体的阳离子型没有特别限定，例如，可以使用质子型、铵离子型、碱金属离子型、碱土金属离子型、稀土金属离子型、过渡金属离子等的形态，但能够更适合使用质子型或铵离子型。 Propylene production in the present invention is a catalyst, the crystalline aluminosilicate cationic binderless shaped body is not particularly limited, for example, using a proton type, an ammonium ion type, type of alkali metal ions, alkaline earth metal ion type, a rare earth metal ionic form, such as a transition metal ion, but can be more suitably used proton type or ammonium ion type. 作为本发明的丙烯制造用催化剂的无粘合剂结晶硅酸铝成型体，可以包含被分类为MFI型晶体结构和/或MEL型晶体结构的结构，例如，也可以包含在国际沸石学会规定的表示结晶分子筛的晶体结构的3文字代号中BEA、MOR、MWW、MTW、FER等其它结构。  The present invention is for producing propylene as binderless crystalline aluminosilicate molded catalyst used, can be classified as containing MFI type crystal structure and / or MEL type crystal structure of the structure, for example, it may be included in the International Zeolite 3 letter codes for other structures BEA, MOR, MWW, MTW, FER, etc. Society predetermined representation of the crystal structure of a crystalline molecular sieve. 但是，从自甲醇和/或二甲醚和/或碳原子数为4〜8的烯烃合成丙烯的反应（以下，在本说明书中记述为丙烯合成反应)中的丙烯收率方面出发，本发明的丙烯制造用催化剂更优选MFI型晶体结构和/或MEL型晶体结构(如上所述，包含MFI型晶体结构和MEL型晶体结构共生的形态）的无粘合剂结晶硅酸铝成型体。 However, aspects of the reaction yield of propylene from the olefin synthesis from propylene and / or dimethyl ether, the number of methanol and / or 4 to 8 carbon atoms (hereinafter, referred to as propylene synthesis reaction in the present specification) in the viewpoint of the present invention the catalyst is more preferably used for producing the propylene MFI type crystal structure and / or MEL type crystal structure (as described above, comprising a MEL type crystal structure and crystal structure of the MFI-type form symbiosis) binderless crystalline aluminosilicate molded. 作为本发明的丙烯制造用催化剂的无粘合剂结晶硅酸铝成型体，实质上不含粘合齐U。  The present invention is for producing propylene as binderless crystalline aluminosilicate molded catalyst used, the adhesive is substantially free of homogeneous U. 因此，具有如下特征：在丙烯合成反应中的乙烯、丙烷等链烷烃、芳香族成分生成量少，丙烯收率、丙烯/丙烷比优异。 Thus, having the following characteristics: ethylene propylene synthesis reaction, paraffins such as propane, aromatic component generated in a small yield of propylene, propylene / propane ratio is excellent. 本发明的丙烯制造用催化剂，其无粘合剂结晶硅酸铝成型体的硅和铝的原子比在特定的范围内。  The propylene present invention for producing a catalyst, which binderless crystalline aluminosilicate molded body of silicon and aluminum atoms in a ratio within a specific range. 即，本发明的丙烯制造用催化剂，无粘合剂结晶硅酸铝成型体的硅和铝的原子比，以硅/铝原子比（Si/Al比）表示，在500〜10000 (以SiO2Al2O3摩尔比换算计为1000/20000)的范围内。 That is, propylene for producing the catalyst of the present invention, non-crystalline aluminosilicate binder ratio of silicon and aluminum atoms molded body to a silicon / aluminum atomic ratio represented by (Si / Al ratio), in 500~10000 (SiO2Al2O3 molar in in terms of the ratio 1000/20000) range. 更优选Si/Al比在1000〜5000 (以Si02/Al203摩尔比换算计为2000/10000)的范围内。 More preferably the Si / Al ratio 1000~5000 (in a Si02 / Al203 molar ratio in terms of 2000/10000) range. 无粘合剂结晶硅酸铝成型体的Si/Al比在500〜10000的范围内的丙烯制造用催化剂，相比于Si/Al比小于500的催化剂，具有如下特征：在丙烯合成反应中的乙烯、丙烷等链烷烃成分、芳香族成分的生成量少，丙烯收率、丙烯/丙烷比变高。  The binderless crystalline aluminosilicate molded Si / Al ratio in the range 500~10000 propylene production of the catalyst, as compared to the Si / Al ratio of the catalyst is less than 500, having the following features: Synthesis of propylene paraffin components in the reaction of ethylene, propane, etc., to generate a small amount of aromatic component, propylene yield, propylene / propane ratio becomes higher. 另外，无粘合剂结晶硅酸铝成型体的Si/Al比在1000〜5000范围内的丙烯制造用催化剂，因为在丙烯合成反应中的乙烯、丙烷等链烷烃成分、芳香族成分的生成量更少，且丙烯收率、丙烯/丙烷比变得更高，故而更加优选。 Further, binderless crystalline aluminosilicate molded Si / Al ratio in the range of 1000~5000 producing propylene using the catalyst as paraffin component ethylene propylene synthesis reaction, propane, chain, the amount of aromatic component less, and the yield of propylene, propylene / propane ratio becomes higher, and therefore more preferable. 另一方面，Si/Al比如果大于10000，则丙烯合成反应的甲醇和二甲醚的转化率就下降，丙烯收率下降。 On the other hand, Si / Al ratio would decrease if it exceeds 10,000, the synthesis reaction of propylene conversion of methanol and dimethyl ether, propylene yield decreased. 无粘合剂结晶硅酸铝成型体的Si/Al比的测定方法没有特别限定，能够使用一般的化学分析法。 Determination of  No crystalline aluminosilicate molded body adhesive Si / Al ratio is not particularly limited, and can be used in chemical analysis in general. 例如，能够对溶解有无粘合剂结晶硅酸铝成型体的试样溶液进行ICP发光分光分析(高频电感耦合等离子体发光分光分析：ICP-AES、ICP-OES), ICP质量分析(高频电感耦合等离子体质量分析：ICP-MS)、原子吸光分析(AAS)，来测定Si/Al比。 For example, possible to ICP emission spectrometry (high-frequency inductively coupled plasma emission spectroscopic analysis: ICP-AES, ICP-OES) to dissolve the sample solution the presence or absence crystalline aluminosilicate binder molded body, ICP mass analysis (High frequency inductively coupled plasma mass analysis: ICP-MS), atomic absorption spectrometry (AAS), measured Si / Al ratio. 无粘合剂结晶硅酸铝成型体，在作为主要构成元素的硅、铝、氧以外，还可以包含硼、碱土金属、稀土金属、钛、错、钇、铁、鎵、磷等元素。  binderless crystalline aluminosilicate molded body as the main constituent elements of silicon, aluminum, oxygen, it also may contain boron, alkaline earth metals, rare earth metals, titanium, wrong, yttrium, iron, gallium, phosphorus and the like element. 这些元素能够以金属盐溶液、氧化物、氢氧化物、烷氧化物等的形式在制备原料成型体时或在无粘合剂结晶硅酸铝成型体中添加。 These elements can be in the form of a metal salt solution, oxides, hydroxides, alkoxides or the like in the preparation of molded material or without added binder crystalline aluminosilicate molded body. 无粘合剂结晶硅酸铝成型体，优选由红外分光分析所观察到的无粘合剂结晶硅酸铝成型体的羟基的峰在特定的范围内。  The binderless shaped crystalline binderless aluminosilicate, preferably an infrared spectroscopic analyzer observed crystalline aluminosilicate molded hydroxyl peak at a specific range. S卩，由红外分光分析，在3715CHT1至3735CHT1的范围内所观察到的无粘合剂结晶硅酸铝成型体的羟基的峰位置优选在3725CHT1至3735CHT1的范围内。 S Jie, infrared spectroscopic analysis, in the range 3715CHT1 3735CHT1 to the observed peak position binderless crystalline aluminosilicate molded body is preferably a hydroxyl group in the range of 3725CHT1 to 3735CHT1. 结晶硅酸铝通过200°C〜500°C加热状态的红外分光分析，在3715CHT1至3735CHT1的范围内观察到羟基峰。  The crystalline aluminosilicate by 200 ° C~500 ° C in a heated state infrared spectroscopy, a peak was observed in the range hydroxy 3715CHT1 to the 3735CHT1. 该峰位置随着结晶硅酸铝的合成条件而变化，或在3725CHT1至3735CHT1的范围内被观察到，或在3715CHT1至小于3725CHT1的范围内被观察到。 The peak position as the crystalline aluminosilicate synthesis conditions vary, or in the range observed to 3725CHT1 3735CHT1 or observed in the range of 3715CHT1 to less than 3725CHT1. 在本发明中，由红外分光分析在3715CHT1至3735CHT1的范围内所观察到的无粘合剂结晶硅酸铝成型体的羟基的峰位置处于3725CHT1至3735CHT1范围内的丙烯制造用催化剂，因为丙烯合成反应的丙烯收率高，催化剂寿命也长，故而优选。 In the present invention, an infrared spectroscopic analyzer observed in the range 3715CHT1 to 3735CHT1 binderless crystalline aluminosilicate molded hydroxyl peak position in the range 3725CHT1 propylene production 3735CHT1 to the catalyst, since the synthesis of propylene propylene yield of the reaction, the catalyst life is long, and therefore preferable. 相对于此，上述羟基的峰位置在3715cm—1至3725cm-1 (不包含3725CHT1)的范围内的丙烯制造用催化剂，因为丙烯合成反应的丙烯收率低，催化剂寿命也短，故而不理想。 In contrast, the peak position of the hydroxyl group in the propylene production in the range (not including 3725CHT1) of 3715cm-1 to 3725cm-1 with a catalyst, the propylene yield is low because the synthesis reaction of propylene, catalyst life is short, it is not preferable. 由红外分光分析进行的3715CHT1至3735CHT1的范围内的轻基峰的观察，能够使用具备对试样进行加热处理的装置的红外分光分析装置进行。 Base peak observed in the range of light to 3735CHT1 3715CHT1 by infrared spectroscopic analysis of , can be performed using an infrared spectroscopic analysis means includes means for heat treatment of a sample. 作为这样的装置，例如，Thermo-Nicolet株式会社(现Thermo Fisher Scientific株式会社)生产的具备高温/高真空室的扩散反射测定装置Spectra-Tech Collector II是适合的。 Measuring the diffuse reflection comprises a high temperature / high vacuum chamber of the apparatus such as, for example, Thermo-Nicolet Corporation (now Thermo Fisher Scientific Co., Ltd.) produced by Spectra-Tech Collector II apparatus is suitable. 在扩散反射测定中，因为试样以粉末形态在分析中供给，所以在分析丙烯制造用催化剂时，必须预先加工为粉末。 In measuring the diffuse reflectance, since the sample supply to the analysis in the form of powder, so that in the analysis of the catalyst for producing the propylene, it must be pre-processed into a powder. 在供给红外分光分析的试样中，使用由氯化铵水溶液或硝酸铵水溶液等离子交换为铵离子型后、由烧制除去氨而制成质子型的无粘合剂结晶硅酸铝成型体，或者使用由盐酸水溶液等离子交换为质子型的无粘合剂结晶硅酸铝成型体。 After  In the infrared spectroscopy of a sample supply, a switching of aqueous ammonium chloride solution or an ammonium nitrate solution ionic plasma, ammonia is removed from the firing made protic binderless crystalline aluminosilicate molded, or by the use of aqueous hydrochloric acid plasma exchange is a proton type binderless crystalline aluminosilicate molded. 红外分光光谱的测定，将加工为粉末的试样加热而进行。  The IR spectroscopic measurement of the sample processed into a powder, heating is performed. 试样的加热温度没有特别限定，例如，如果加热到200°C〜500°C而进行，就容易观察到3715CHT1至3735CHT1范围内的羟基的峰。 The heating temperature of the sample is not particularly limited, for example, if heated to 200 ° C~500 ° C is carried out, it is easy hydroxyl peak observed in the range of 3715CHT1 to 3735CHT1. 试样的加热温度即使低于200°C，有时也能够观察到上述范围内的羟基峰，但一般而言，结晶硅酸铝如果与从室温至200°C范围内的大气接触，就容易吸附大气中的水分，而峰位置有时偏离，所以推荐200°C〜500°C范围内的加热温度。 Even if the heating temperature of the sample is less than 200 ° C, the hydroxyl group may sometimes be observed peak within the aforementioned range, but in general, if the crystalline aluminosilicate into contact with the atmosphere from room temperature to 200 ° C range, it is readily adsorbed atmospheric moisture, and the peak position may deviate, it is recommended that the heating temperature in the range of C 200 ° C~500 °. 红外分光光谱的测定气氛没有特别限定，例如，在空气或氦、氮等不活泼气体气氛下或在真空下能够观察到3715cm-1至3735CHT1的范围内的羟基的峰。 Infrared spectroscopic measurement atmosphere is not particularly limited, for example, under air or helium, an inert gas atmosphere such as nitrogen or hydroxyl group peak can be observed in the range of 3715cm-1 to 3735CHT1 in vacuo. 本发明的丙烯制造用催化剂的制造方法没有特别限制，但优选包括如下的转化工序，其中，使由包含硅成分、铝成分和结构导向剂成分的固体成分构成的原料成型体，或者使由包含硅成分、铝成分、碱金属成分和结构导向剂成分的固体成分构成的原料成型体接触包含饱和水蒸气的气氛，将硅成分和铝成分几乎全部量转化为结晶硅酸铝。  The propylene production according to the present invention is not a method for producing the catalyst is not particularly limited, but preferably comprises a conversion step, where the which contains silicon component material molded solid component an aluminum component and directing agent component structure composed of, or that the component which contains silicon, aluminum component, the molded material contacting the solid alkali metal component and a structure directing agent component is comprised of saturated steam atmosphere, the silicon component and the aluminum component is converted to the substantially entire crystalline aluminosilicate. 根据该制造方法，因为丙烯制造用催化剂实质上不包含粘合剂，所以相比于从必须有粘合剂的以往的水性反应浆料中所制造的结晶硅酸铝粉末制造的催化剂，丙烯合成反应中的乙烯、丙烷等的链烷烃、芳香族成分的生成量少，丙烯收率、丙烯/丙烷比优异。 According to this manufacturing method, since the adhesive contains substantially no propylene production catalyst, as compared to a catalyst slurry produced crystalline aluminosilicate powder produced from the reaction must be a conventional aqueous binder, synthetic propylene reaction of ethylene, propane, alkanes, aromatic component generated in a small yield of propylene, propylene / propane ratio is excellent. 另外，本发明的丙烯制造用催化剂的制造方法，优选至少包括一次如下的烧制工序，其中，在碱金属成分的存在下对无粘合剂结晶硅酸铝成型体进行烧制。  Further, the propylene production method of the present invention for producing a catalyst, preferably comprising at least one firing step below, wherein, in the presence of an alkali metal component on an adhesive-free crystalline aluminosilicate molded body is fired. 上述烧制工序中的无粘合剂结晶硅酸铝成型体的碱金属和铝的原子比，以碱金属/铝原子比表示，优选为4〜200的范围内，更优选为10〜200的范围内。 Alkali metal and aluminum atoms of the above-described firing step binderless crystalline aluminosilicate molded ratio of alkali metal / aluminum atomic ratio, preferably in the range of 4~200, more preferably of 10~200 range. 在碱金属成分存在下进行烧制的情况下，因为丙烯合成反应的丙烯收率高，催化剂寿命也长，所以成为实用的丙烯制造用催化剂。  in the case of firing in the presence of an alkali metal component, because the propylene yield of the synthesis reaction of propylene, catalyst life is long, it becomes a practical catalyst for propylene production. 另外，在烧制工序中的无粘合剂结晶硅酸铝成型体的碱金属/铝原子比为4以上时，由红外分光分析在3715CHT1至3735CHT1的范围内所观察到的无粘合剂结晶硅酸铝成型体的羟基的峰位置成为3725CHT1至3735CHT1的范围内，丙烯合成反应的丙烯收率更高，催化剂寿命也更长，因此成为更实用的丙烯制造用催化剂。 Further, in the firing step, an adhesive-free crystalline alkali metal aluminosilicate molded body / aluminum atomic ratio is 4 or more, an infrared spectroscopic analyzer observed in the range 3715CHT1 to 3735CHT1 binderless crystalline hydroxy aluminum silicate peak position of a molded article to the range 3725CHT1 3735CHT1 and higher yield of propylene propylene synthesis reaction, and longer catalyst life, and therefore a more useful catalyst for propylene production. 另外，因为上述烧制工序中的无粘合剂结晶硅酸铝成型体的碱金属/铝原子比越大，丙烯合成反应中的丙烯收率变得越高，催化剂寿命也变得越长，所以上述烧制工序的无粘合剂结晶硅酸铝成型体的碱金属/铝原子比更优选为10以上。  Further, since the above-described firing the binderless crystalline alkali metal silicate in step molded body / aluminum atomic ratio increases the propylene yield, propylene synthesis reaction becomes higher, the catalyst life becomes the longer, the above-described firing step binderless crystalline alkali metal aluminosilicate molded body / aluminum atomic ratio is more preferably 10 or more. 另一方面，上述烧制工序的无粘合剂结晶硅酸铝成型体的碱金属/铝原子比的上限，从上述2个观点出发并不被限定，即由红外分光分析所观察到的无粘合剂结晶硅酸铝成型体的羟基峰的位置和丙烯合成反应的丙烯收率、寿命性能的观点。  On the other hand, the above-described firing step binderless crystalline alkali metal aluminum silicate molded body / aluminum atomic ratio of the upper limit, from the viewpoint of the two it is not limited, i.e., observed by the infrared spectroscopic analysis no crystalline aluminosilicate binder to yield propylene and propylene-hydroxy position of the peak of the molded synthetic reaction, life performance point of view. 但是，如果上述烧制工序的无粘合剂结晶硅酸铝成型体的碱金属/铝原子比的上限大于200，虽然没有丙烯合成反应的性能上的问题，但催化剂制造工序的操作有时会变差，从操作性方面出发，优选碱金属/铝原子比为200以下。 However, if the above-described firing step binderless crystalline alkali metal aluminum silicate molded body / aluminum atomic ratio is greater than the upper limit of 200, although no problem in Propylene synthesis reaction, but the operation of the manufacturing process of the catalyst can sometimes be difference, from the viewpoint of workability, preferably the alkali metal / aluminum atomic ratio of 200 or less. 接着，更加具体地说明本发明的丙烯制造用催化剂的制造方法。  Next, the present invention is described more specifically a method for producing a catalyst for producing the propylene used. 本发明的丙烯制造用催化剂的制造工序，优选至少包括在以下列举的从第I工序至第3工序的3个工序。 Propylene production process of the present invention for producing a catalyst, preferably at least three steps including a first step to third step I from the following listed. 第I工序：使由至少包含硅成分、铝成分和结构导向剂的固体成分构成的原料成型体接触包含饱和水蒸气的气氛，合成无粘合剂结晶硅酸铝成型体的工序(转化工序)。  Process I: that the atmosphere comprises at least a silicon component, an aluminum component raw molded body contact structure directing agent and a solid component composed of a saturated water vapor, adhesive-free synthetic crystalline aluminosilicate of a molded body ( conversion step). 第2工序：优选在碱金属成分的存在下，对在第I工序得到的无粘合剂结晶硅酸铝成型体进行烧制的工序(烧制工序)。  Step 2: preferably in the presence of an alkali metal component, the crystallization of aluminum in Process I binderless molded body obtained in the step fired (firing step). 第3工序：将在第2工序得到的无粘合剂结晶硅酸铝成型体的阳离子型制成质子型或铵离子型的工序(离子交换工序)。  Step 3: The crystalline aluminosilicate molded body made cationic proton type or ammonium ion type, the step (ion exchange step) In the second step binderless obtained. 作为本发明的丙烯制造用催化剂的无粘合剂结晶硅酸铝成型体通过使由至少包含硅成分、铝成分和结构导向剂成分的固体成分构成的原料成型体接触包含饱和水蒸气的气氛而合成(第I工序)。  The present invention as propylene production binderless crystalline aluminosilicate molded catalyst comprising a shaped body by contacting a feed comprising at least a silicon component, an aluminum component and a solid component directing agent component structure composed of saturated steam atmosphere synthesized (step I). 硅成分的原料没有特别限定，多孔二氧化硅载体、二氧化硅粉末、胶体二氧化硅、硅酸钠水溶液(硅酸钠)、烷氧基硅烷等能够作为硅成分使用。  The raw silicon component is not particularly limited, and a porous silica support, silica powder, colloidal silica, sodium silicate solution (sodium silicate), alkoxysilanes and the like can be used as a silicon component. 其中，多孔质的二氧化硅载体因为纯度高容易使用故而优选。 Wherein the porous silica carrier is easy to use because of high purity and therefore preferable. 在原料中使用胶体二氧化硅、硅酸钠水溶液或烷氧基硅烷时，能够将利用酸处理或碱处理得到的二氧化硅水凝胶作为原料，制备多孔二氧化硅载体而使用。 Colloidal silica in the feed, an aqueous solution of sodium silicate or alkoxysilane, can be used silica hydrogel using acid treatment or alkali treatment was used as a starting material, preparation of a porous silica support. 另外，在酸处理和碱处理时也可以并用铝成分原料，制备含有铝成分的多孔二氧化硅-氧化铝载体来使用。 In addition, acid treatment and alkali treatment may be aluminum and component materials, the aluminum component comprising a porous silica - alumina support used. 铝成分原料也没有特别限定，铝的硫酸盐、硝酸盐、卤化物、氧化物、氢氧化物、烷氧化物等能够作为铝成分使用。  The aluminum content in the feedstock is not particularly limited, aluminum sulfates, nitrates, halides, oxides, hydroxides, alkoxides and the like can be used as an aluminum component. 另外，也可以使用铝酸盐。 It is also possible to use aluminate. 其中，硫酸铝的水合物、硝酸铝的水合物、碱金属的铝酸盐、水合氢氧化铝、拟薄水铝石、异丙醇铝易于使用而适合。 Wherein, hydrate of aluminum sulfate, aluminum nitrate hydrate, alkali metal aluminosilicate, hydrated alumina, pseudo boehmite, aluminum isopropoxide for ease of use. 结构导向剂成分没有特别限定，能够适当使用四甲基氢氧化铵、甲基三乙基氢氧化铵、四乙基氢氧化铵、四丙基氢氧化铵、四丁基氢氧化铵、四甲基氯化铵、甲基三乙基溴化铵、四乙基溴化铵、四丙基溴化铵、四丁基溴化铵等四烷基铵盐化合物。  The structure directing agent component is not particularly limited, and can be suitably used tetramethylammonium hydroxide, methyltriethylammonium hydroxide, tetraethyl ammonium hydroxide, tetrapropyl ammonium hydroxide, tetrabutyl ammonium hydroxide, tetra methyl chloride, methyl bromide, triethylammonium, tetraethylammonium bromide, tetrapropylammonium bromide, tetrabutylammonium bromide, tetraalkylammonium salt and the like compounds. 另外，这些四烷基铵盐化合物，即使与正丙基胺、二正丙基胺、三正丙基胺、乙二胺、二氨基丙烷、二甘醇胺等有机胺类一起使用，也能够合成包含MFI型晶体结构和/或MEL型晶体结构的无粘合剂结晶硅酸铝成型体。 Further, the tetraalkylammonium salt compound, even when used together with n-propylamine, di-n-propylamine, tri-n-propylamine, ethylenediamine, diaminopropane, diglycolamine and the like, organic amines can be synthesis of MFI-type crystal structure containing and / or MEL type binderless crystalline aluminosilicate molded crystal structure. 特别在四烷基铵盐化合物为四乙基氢氧化铵、四丙基氢氧化铵、四丙基溴化铵、四丁基氢氧化铵、四丁基溴化铵时，因为包含MFI型晶体结构和/或MEL型晶体结构的结晶娃酸招的结晶性变闻，故而优选。 In particular tetraalkylammonium salt compound is tetraethylammonium hydroxide, tetrapropylammonium hydroxide, tetrapropylammonium bromide, tetrabutylammonium hydroxide, tetrabutylammonium bromide when, as MFI-type crystal structure and comprising / or crystallization baby crystallinity of strokes acid smell MEL type crystal structure, which is preferable. 在本发明的丙烯制造用催化剂的制造方法中，原料成型体的制备方法没有特别限定，例如，可以列举以下的方法。  In the present invention, the propylene production method for producing a catalyst, preparing a raw material of the molded body is not particularly limited, and for example, the following method can be exemplified. (方法I)在多孔二氧化硅载体中载持铝成分、结构导向剂成分等的方法。  (Method I) Method carrier supporting porous silica aluminum component, structure directing agent component or the like. (方法2)在多孔二氧化硅-氧化铝载体中载持结构导向剂成分等的方法。  (Method 2) In the porous silica - Method holding structure directing agent component or the like contained in the alumina support. (方法3)从硅成分、铝成分、结构导向剂成分等制备原料成型体的方法。  (Method 3) The method of preparing a silicon component, an aluminum component, structure directing agent and other components from the raw material of the molded body. 在硅成分原料中使用多孔二氧化硅载体时，能够在铝成分、结构导向剂成分、碱金属成分等原料物质的溶液中含浸多孔二氧化硅载体，在多孔二氧化硅载体中载持铝成分、结构导向剂成分、碱金属成分等的成分，制备原料成型体。  When using a porous silica support component in the silicon raw material can be impregnated porous silica support in a solution of aluminum raw material composition, structure directing agent component, alkali metal component and the like contained in the porous silica support an aluminum component holding, component structure directing agent component, alkali metal component and the like, prepared molded material. 此时，既可以同时载持各种成分，也可以依次载持各种成分。 At this time, it may be simultaneously supported the various components, may be supported in turn various components. 另外，各种成分的载持顺序也没有特别限定。 Further, the order of carrying the various ingredients is not particularly limited. 而且，如后所述，碱金属成分既可以在原料成型体的制备工序中使用，也可以不使用。 Further, as described later, the alkali metal component may be used in the preparation of a raw molded body, it may not be used. 多孔二氧化硅载体的形状没有特别限定，例如，可以使用球状、椭圆状、圆柱状、环状、板状、片状、蜂窝状、花瓣状等形状。  The shape of the porous silica support is not particularly limited, for example, a spherical, elliptical, cylindrical, ring, plate, sheet, honeycomb, petaloid shape. 另外，多孔二氧化硅载体的尺寸也没有特别限定，例如,可以使用50μηι〜100 μ m范围的多孔二氧化娃载体。 Further, the size of the porous silica support is not particularly limited, for example, may be used μ m range 50μηι~100 baby porous silica support. 铝成分在多孔二氧化硅载体中的载持方法没有特别限定，例如，能够使多孔二氧化硅载体含浸在铝成分的水溶液或醇溶液中，然后，以倾析、过滤、加热、减压加热等操作除去溶剂，向多孔二氧化硅载体载持铝成分。  The method of the aluminum component supported on a porous silica support is not particularly limited, and for example, can be made by impregnating a porous silica support in an aqueous or alcoholic solution of an aluminum component, and then to decantation, filtration, heating, heating under reduced pressure to remove the solvent, the porous silica support supporting aluminum component. 此时的铝成分的使用量，原料成型体的Si/Al比为500〜10000范围内的铝成分量，由于最终丙烯制造用催化剂的结晶硅酸铝的Si/Al比为500〜10000的范围内，故而优选。 At this time, the amount of aluminum component, Si raw molded body / Al ratio of the amount of aluminum in the range of 500~10000 component, since the final propylene producing a crystalline silicate catalyst with a Si / Al ratio is in the range 500~10000 inside, which is preferable. 用于含浸的铝成分的水溶液和醇溶液的量没有特别限定，从铝成分均匀地扩散出发，只要是多孔二氧化硅载体的细孔容积以上即可，优选为多孔二氧化硅载体的细孔容积的2〜5倍量。 The amount of aluminum component and an alcohol aqueous solution for impregnation is not particularly limited, from the starting aluminum component uniformly diffused, as long as the above pore volume of porous silica support, and is preferably a porous silica support pores 2 ~ 5 times the amount of volume. 多孔二氧化硅载体的含浸时间没有特别限定，只要是铝成分扩散在多孔二氧化硅载体的全部细孔中那样的时间即可，通常在O. 5小时〜24小时范围内的时间就足够。 Time impregnated porous silica support is not particularly limited as long as the aluminum component is diffused in all the pores of the porous silica support can be as time, the time is usually within the range of O. 5 hours ~ 24 hours is sufficient. 结构导向剂成分在多孔二氧化硅载体中载持的方法没有特别限定，例如，能够使多孔二氧化硅载体含浸在结构导向剂或者在结构导向剂的水溶液或醇溶液中，然后，以倾析、过滤、加热、减压加热等操作除去溶剂，向多孔二氧化硅载体载持结构导向剂成分。  The method of the structure directing agent in the porous silica support component supported is not particularly limited, e.g., possible to impregnate the porous silica support structure directing agent in an aqueous or alcoholic solution or structure-directing agent, and then, decantation, filtration, heating, heating under reduced pressure to remove the solvent, the porous silica support component supporting structure directing agent. 结构导向剂在多孔二氧化硅载体中的载持量没有特别限定，以多孔二氧化硅载体中的Si成分的摩尔数为分母、以在多孔二氧化硅载体中载持的结构导向剂成分的摩尔数为分子所表示的数值优选在O. 02〜O. 15的范围内，更优选在O. 04〜O. 08的范围内。 Supporting amount of structure directing agents in the porous silica support is not particularly limited, and the number of moles of the Si component in the porous silica support as a denominator to structure directing agent component in the porous silica support is supported mole number of molecules represented by a value in the range of preferably O. 02~O. 15, and more preferably in the range of O. 04~O. 08 in. 碱金属成分向多孔二氧化硅载体载持的方法没有特别限定，例如，能够使多孔二氧化硅载体含浸在碱金属成分的水溶液或醇溶液中，然后，以倾析、过滤、加热、减压加热等操作除去溶剂，向多孔二氧化硅载体载持碱金属成分。  an alkali metal component supported to the porous silica support is not particularly limited, for example, can be made by impregnating a porous silica support in an aqueous or alcoholic solution of an alkali metal component, and then to decantation, filtration, heating , heating under reduced pressure to remove the solvent, the porous silica support supported alkali metal component. 在从多孔二氧化硅-氧化铝载体制备原料成型体时，能够在结构导向剂成分、碱金属成分等原料物质的溶液中含浸多孔二氧化硅-氧化铝载体，在多孔二氧化硅-氧化铝载体中载持结构导向剂成分、碱金属成分等成分，制备原料成型体。  In the porous silica - alumina carrier prepared molded material, porous silica can be impregnated with the solution of starting materials structure directing agent component, alkali metal component and the like - alumina support, the porous silica - alumina support supporting structure directing agent component, alkali metal component and other ingredients, the preparation of molded material. 多孔二氧化硅-氧化铝载体的形状和尺寸，可以使用与多孔二氧化硅载体同样的形状和尺寸。 Porous silica - alumina support shapes and sizes may be used with the same shape and size as the porous silica support. 结构导向剂成分或碱金属成分的载持顺序、载持方法、载持条件、碱金属成分添加工序的位置，可以与从多孔二氧化硅制备原料成型体时同样操作。 Guide carrier ingredients or alkali metal component support structure sequentially, methods supported, supporting conditions, the position of the step of adding an alkali metal component, may be prepared in the same manner when a porous silica body molded from a raw material. (方法 3)  另外，在本发明的丙烯制造用催化剂的制造方法中，也可以从硅成分、铝成分、结构导向剂成分、碱金属成分等直接制备原料成型体。  (Method 3)  Further, according to the present invention, the propylene production method for producing a catalyst, the raw material may be molded directly prepared from a silicon component, an aluminum component, structure directing agent component, alkali metal component or the like. 例如，能够将胶体二氧化硅或二氧化硅粉末与铝成分、结构导向剂成分和碱金属成分搅拌混合，进行加热干燥，制备原料成型体。 For example, colloidal silica or silica powder and an aluminum component, structure directing agent and an alkali metal component composition can be stirred and mixed, heated and dried to prepare a raw molded body. 此时，得到的原料成型体加工为球状、圆柱状、环状等适当的形状、尺寸，在无粘合剂结晶硅酸铝成型体的合成中使用。 In this case, the molded body obtained by processing the raw material is spherical, cylindrical, ring and other appropriate shape, size, binder-free synthetic crystalline aluminosilicate molded body used. 在本发明的丙烯制造用催化剂的制造方法中，通过使由上述方法制备的原料成型体接触包含饱和水蒸气的气氛，合成无粘合剂结晶硅酸铝成型体(第I工序)。  In the (Process I) of the present invention, the propylene production method for producing a catalyst by contacting the shaped material prepared by the above method contains saturated steam atmosphere, without adhesive synthetic crystalline aluminosilicate molded . 此时的饱和水蒸气的温度，只要将原料成型体转化为无粘合剂结晶硅酸铝成型体即可，因此没有特别限定，但因为100°c〜230°C范围内的温度引起MFI型晶体结构和/或MEL型晶体结构的结晶化，故而优选。 Temperature of saturated steam at this time, as long as the raw molded body into the molded body binderless crystalline aluminosilicate can, therefore is not particularly limited, but since the temperature within the range of 100 ° c~230 ° C due to the MFI crystal structure and / or MEL type crystal structure of crystallization, which is preferable. 另外，120〜180°C范围内的温度使包含MFI型晶体结构和/或MEL型晶体结构的无粘合剂结晶硅酸铝成型体的结晶性变高，故而更为优选。 Further, a temperature in the range of 120~180 ° C so that the crystal structure of the MFI type and / or MEL type binderless crystalline aluminosilicate crystal structure of crystallinity of molded article is high, and therefore is more preferable. 使原料成型体接触包含饱和水蒸气的气氛的时间没有特别限定，以2小时〜200小时范围内的接触时间，能够转化为包含MFI型晶体结构和/或MEL型晶体结构的无粘合剂结晶硅酸铝成型体。 Contacting a feed comprising the molded body of time saturated steam atmosphere is not particularly limited, and a contact time of 2 hours ~ 200 hours range, can be converted to the MFI type crystal structure and / or MEL type binderless crystalline crystal structure aluminum molded body. 用于使原料成型体接触包含饱和水蒸气的气氛的方法及其装置，只要是能够将原料成型体转化为无粘合剂结晶硅酸铝成型体即可，因此没有特别限定。  The starting material for molded bodies comprising contacting an atmosphere of saturated steam method and apparatus, as long as the material is capable molded into binderless crystalline aluminosilicate can be molded, and therefore is not particularly limited. 例如，能够在耐压容器中设置原料成型体，在容器下部以不与原料成型体接触的方式加入水并密封后，在恒温槽内进行加热，由此合成无粘合剂结晶硅酸铝成型体。 For example, after the raw material can be provided in a pressure vessel shaped body, at a lower portion of the container so as not to contact with the material molded body was added with water and sealed, heated in a thermostatic chamber, thereby forming synthetic crystalline aluminosilicate binderless body. 此时，在容器下部加入的水的量优选为由进行结晶化的温度和耐压容器的容积所决定的饱和水蒸气量与原料成型体吸附的水蒸气量之和以上的量。 And the amount of saturated vapor over the amount of raw molded body case, the amount of water added the lower portion of the container preferably by the crystallization temperature and volume of the pressure vessel in an amount determined by adsorption of water vapor. 这样的量，相对原料成型体重量，通常为20wt%以上。 Such an amount, relative to the weight of molded material, typically less than 20wt%. 另外，也可以在耐压容器中加入原料成型体，使饱和水蒸气在耐压容器中流通，合成无粘合剂结晶硅酸铝成型体。 Further, it may also be added in a pressure vessel material molded body, so that the flow of saturated water vapor in a pressure vessel, the synthetic crystalline aluminosilicate binder-free shaped bodies. 这样操作合成的无粘合剂结晶硅酸铝成型体，由于在原料中使用的硅成分和铝成分的几乎全部量被转化为结晶硅酸铝，而且，保持着原料成型体的形状、尺寸而被直接转化为结晶硅酸铝，所以在合成的成型体中就在本质上不含粘合剂成分。  Such adhesive-free operation synthetic crystalline aluminosilicate molded body, since the silicon component and the aluminum component used in almost all amount of the raw material is converted to crystalline aluminosilicate, but, with the shape of the molded material , it is converted directly to the size of crystalline aluminosilicate, so essentially no binder component in the synthesized molded body. 在第I工序中合成的无粘合剂结晶硅酸铝成型体，以除去结构导向剂成分和赋予丙烯合成反应的催化剂性能的2个目的进行烧制。  In the first synthetic step I binderless crystalline aluminosilicate molded body was removed to a second object-oriented structure and performance of the catalyst imparting agent component synthesis reaction of propylene firing. 以前者的目的进行烧制时，不需要碱金属成分，但以后者的目的进行烧制时，如后所述，因为在无粘合剂结晶硅酸铝成型体的碱金属/铝原子比为4〜200的范围内，在碱金属成分存在下进行烧制，最终得到的催化剂性能更加提高，故而优选。 When the object by firing, no alkali metal components, but the purpose of the latter is fired before, as described later, since the adhesive-free alkali metal crystalline aluminosilicate molded body / aluminum atomic ratio of within the range of 4~200, in the presence of an alkali metal component fired properties of the final catalyst obtained is more improved, which is preferable. 因此，以除去结构导向剂成分和赋予丙烯合成反应性能为目的，既可以在碱金属成分存在下进行I次烧制，也可以分割为除去结构导向剂成分目的的烧制和赋予丙烯合成反应性能目的的碱金属成分存在下的烧制来进行。 Thus, synthesis and properties of the structure-directing agent component for the purpose of imparting propylene was removed, baking may be performed in the I-th presence of alkali metal component, may be divided into a structure directing agent component object and firing properties imparted Synthesis of propylene was removed firing the presence of alkali metal component to the purpose. 通过将在第2工序的烧制中使用的无粘合剂结晶硅酸铝成型体的碱金属和铝的原子比，以碱金属/铝原子比表示设为4〜200的范围内，本发明的丙烯制造用催化剂就成为更良好的催化剂。  by atomic ratio of the alkali metal crystalline aluminosilicate binderless shaped body to be used in the firing in the second step and aluminum, alkali metal / aluminum atomic ratio is set within the range of 4~200 propylene present invention for producing the catalyst became a better catalyst. 用于使碱金属成分存在于在第2工序的烧制中使用的无粘合剂结晶硅酸铝成型体中的碱金属成分添加工序的时间，只要是在进行第2工序的最终烧制以前，就没有特别限定，在任何阶段均可。 For alkali metal component is present in the adhesive-free crystals used in the firing in the second step of the alkali metal silicate component molded body addition time step as long as the second step is performed before the final firing is not particularly limited, may, at any stage. 另外，添加碱金属成分的次数也没有特别限定。 Further, the number of added alkali metal components is not particularly limited. 为了将在第2工序的烧制中使用的无粘合剂结晶硅酸铝成型体的碱金属/铝原子比设在4〜200的范围内，例如，可以列举在制备由包含硅成分、铝成分和结构导向剂的固体成分构成的原料成型体的工序的任何阶段，或者在原料成型体中，添加使得在第2工序的烧制中使用的无粘合剂结晶硅酸铝成型体的碱金属/铝原子比为4〜200范围内的量的碱金属成分的方法。  For non-crystalline binder used in the firing in the second step alkali metal silicate molded body / aluminum atomic ratio in the range of 4~200 provided, for example, it may include preparation which contains silicon in any stage of the process material molded component, an aluminum component and a solid component composed of a structure directing agent, or the starting material molded body, a binder is added so that no molded crystalline aluminosilicate used in the firing in the second step alkali metal body / aluminum atomic ratio of the alkali metal component is an amount in the range of 4~200 method of. 此时，在原料成型体中包含的碱金属成分虽然被大致保持在第I工序中接触包含饱和水蒸气的气氛而得到的无粘合剂结晶硅酸铝成型体中，但是也可以在第I工序中得到的无粘合剂结晶硅酸铝成型体中再添加碱金属成分。 In this case, the alkali metal component contained in the feedstock are substantially shaped body while held in an atmosphere comprising contacting step I of saturated steam obtained binderless crystalline aluminosilicate molded body, it may be I, binderless crystalline aluminosilicate obtained in the step shaped body and then adding an alkali metal component. 特别在进行第I工序中得到的无粘合剂结晶硅酸铝成型体的清洗时，有时无粘合剂结晶硅酸铝成型体中的一部分或全部碱金属成分会溶出，所以优选再添加碱金属成分，将第2工序的烧制中使用的无粘合剂结晶硅酸铝成型体的碱金属/铝原子比设为4〜200的范围内。 No special adhesive during the crystallization step I of aluminosilicate obtained when cleaning the molded body, sometimes binderless crystalline aluminosilicate molded part or all of the alkali metal components is eluted, it is preferable to add a base metal component, the adhesive-free baking in the second step using an alkali metal crystalline aluminosilicate molded body / aluminum atomic ratio is set within the range of 4~200. 另外，在第I工序中使碱金属/铝原子比小于4的范围内的原料成型体接触包含饱和水蒸气的气氛而合成无粘合剂结晶硅酸铝成型体的情况下，也可以在进行第2工序的烧制前，对在第I工序中得到的无粘合剂结晶硅酸铝成型体添加碱金属成分，使得碱金属/铝原子比成为4〜200的范围内。 Contacting the atmosphere forming material in the range of  Furthermore, in step I, manipulation alkali / aluminum atomic ratio of less than 4 containing saturated steam and in the case no adhesive synthetic crystalline aluminosilicate molded, also may be performed before firing the second step, a binder for non-I obtained in the first step crystalline aluminosilicate molded adding an alkali metal component, such that the alkali metal / aluminum atomic ratio is in a range of 4~200. 因为原料成型体中包含的碱金属成分的量少时，在第I工序中得到的无粘合剂结晶硅酸铝成型体的包含MFI型晶体结构和/或MEL型晶体结构的结晶硅酸铝的结晶性变高，所以更优选在原料成型体的制备工序和第I工序中不使用碱金属成分，而在第2工序的烧制前添加碱金属成分的方法。  because a small amount of alkali metal components contained in the raw molded body, binderless I crystals obtained in the first step a crystalline aluminosilicate molded body comprising MFI type crystal structure and / or MEL type crystal structure crystalline aluminosilicate becomes high, it is more preferable not to use an alkali metal component in a raw material preparation step and the molded body in step I, an alkali metal component is added in the second step before firing. 此时，以碱金属/硅原子比表示，在原料成型体和第I工序的无粘合剂结晶硅酸铝成型体中包含的碱金属量的更优选范围为小于O. 0001。 At this time, the alkali metal / silicon atomic ratio in the binderless shaped body and the material of step I and more preferably in the range crystalline aluminosilicate amount of alkali metal contained in the molded body is smaller than O. 0001. 在本发明的丙烯制造用催化剂的制造方法中，碱金属成分能够使用选自锂、钠、钾、铷、铯中的至少I种。  The method for producing a catalyst, the alkali metal component I can be selected from at least one lithium, sodium, potassium, rubidium, cesium, propylene production in the present invention. 能够使用的碱金属化合物没有特别限定，例如，可以使用锂、钠、钾、铷、铯的氢氧化物、卤化物、硝酸盐、硫酸盐、乙酸盐、碳酸盐、碳酸氢盐等。 An alkali metal compound used is not particularly limited and can be, for example, lithium, sodium, potassium, rubidium, cesium hydroxide, halide, nitrate, sulfate, acetate, carbonate, bicarbonate or the like. 其中，钠、钾、铯的氢氧化物、氯化物、硝酸盐、硫酸盐、碳酸盐、碳酸氢盐廉价、容易使用而优选。 Among them, sodium, potassium, cesium hydroxide, chloride, nitrate, sulfate, carbonate, bicarbonate inexpensive, easy to use and preferred. 这些碱金属化合物既可以单独使用也可以并用。 These alkali metal compounds may be used alone or in combination. 另外，在四丙基氢氧化铵溶液等的结构导向剂中，有时会包含碱金属离子，在这样的情况下，也可以利用结构导向剂中的碱金属离子。 Further, in the structure of tetrapropyl ammonium hydroxide solution and the like directing agents sometimes contain alkali metal ions, in this case, alkali metal ions may also be utilized in the structure-directing agent. 铝酸钠或铝酸钾等碱金属的铝酸盐也可以作为碱金属成分使用，由于它们廉价且为水溶性，所以容易使用，为优选的原料。  The alkali metal aluminate or potassium aluminate, sodium aluminate and the like may be used as the alkali metal component, because they are inexpensive and are water-soluble, it is easy to use, the preferred starting material. 因为铝酸盐也包含铝成分，所以在制备原料成形体时使用，此时，如果仅使用碱金属的铝酸盐，因为碱金属的铝酸盐的碱金属/铝原子比大致为I〜2，所以必须注意碱金属/铝原子比成为了不足4。 Because aluminate also contains an aluminum component, the raw material used in the preparation of molded case, if only the alkali metal aluminate, alkali metal aluminate as an alkali metal / aluminum atomic ratio is substantially I~2 , it must be noted that the alkali metal / aluminum atomic ratio became less than 4. 在这样的情况下，可以想办法添加其它碱金属化合物等使碱金属/铝原子比成为4〜200的范围内。 In such a case, it is possible to find ways to add an alkali metal compound in the alkali metal / aluminum atomic ratio is in a range of 4~200. (碱金属成分的添加方法） 添加碱金属成分的方法没有特别限定，在碱金属化合物的水溶液或醇溶液、包含碱金属离子的四丙基氢氧化铵溶液等中浸溃并载持原料成型体或无粘合剂结晶硅酸铝成型体的方法简便而优选。  (method of adding an alkali metal component)  The method of adding an alkali metal component is not particularly limited, in aqueous or alcoholic solution of an alkali metal compound, containing tetrapropyl ammonium hydroxide solution of an alkali metal ion or the like impregnated crushed and supporting material molded or binderless aluminosilicate molded crystallization method is simple and preferable. 另外，也可以使用在氯化钾等碱金属化合物存在下，对无粘合剂结晶硅酸铝成型体进行热处理的固相离子交换法。 Further, may also be used in the presence of potassium chloride, alkali metal compounds, binderless crystalline aluminosilicate is heat-treated molded body of the solid phase ion exchange method. 烧制温度优选300°C〜800°C范围内的温度。  The firing temperature is preferably a temperature within 300 ° C~800 ° C range. 烧制时，在无粘合剂结晶硅酸铝成型体包含结构导向剂时，400°C〜800°C范围内的温度有效而更为优选。 When firing the binderless crystalline aluminosilicate comprises a molded body when the structure-directing agent, a temperature in the range of 400 ° C~800 ° C is more effective and preferable. 烧制时间没有特别限定，进行O. I小时〜24小时就足够。 The firing time is not particularly limited, and O. I h ~ 24 hours is sufficient. 烧制的气体气氛没有特别限定，例如，可以使用空气的气氛或氮、氦、氩等不活泼气体的气氛，另外，也可以使用以氮、氦、氩等不活泼气体稀释的氧或空气的气氛。 Gas firing atmosphere is not particularly limited, and for example, may be used an air atmosphere or an inert gas atmosphere such as nitrogen, helium, argon, etc., is also possible to use nitrogen, helium, argon, and other inert gas diluted oxygen or air atmosphere. 在碱金属成分存在下烧制的无粘合剂结晶硅酸铝成型体，因为包含碱金属离子， 所以在用于丙烯合成反应之前，进行离子交换操作，转化为质子型、铵离子型等的阳离子型(第3工序)。  In the presence of adhesive-free crystalline alkali metal component aluminosilicate fired molded body, because it contains alkali metal ions, so before the propylene synthesis reaction, an ion exchange operation, is converted to a proton type, an ammonium ion cationic type or the like (third step). 离子交换方法没有特别限定，可以用一般结晶分子筛的离子交换方法进行。  The method of ion exchange is not particularly limited, but ion exchange may be performed by a general crystalline molecular sieve. 例如，在铵离子交换时，能够通过在从室温至100°c的温度范围内浸溃在氯化铵或硝酸铵等铵盐化合物的水溶液中而进行。 For example, when the ammonium ion-exchange, dipping in an aqueous solution is carried out from room temperature to 100 ° c in a temperature range of ammonium nitrate or other ammonium salt compound through. 另外，也可以利用在氯化铵等的存在下将无粘合剂结晶硅酸铝成型体进行烧制的固相离子交换法进行离子交换。 Further, it may also be utilized in the presence of ammonium chloride or the like binderless crystalline aluminosilicate molded fired body of the solid phase ion exchange ion exchange. 通过从该铵离子型的无粘合剂结晶硅酸铝成型体中将氨烧制除去，能够制成质子型的无粘合剂结晶硅酸铝成型体。 Firing the shaped body will be removed by the ammonia from the ammonium ion crystalline aluminosilicate-type binder-free, can be made of a proton-type binderless crystalline aluminosilicate molded. 另外，质子型的无粘合剂结晶硅酸铝成型体，例如，也能够通过在从室温至100°c的温度范围内浸溃在盐酸水溶液或硝酸水溶液等中来制备。 Further, the proton type binderless crystalline aluminosilicate molded body, for example, it is possible to pass from room temperature to within a temperature range of 100 ° c impregnation prepared in aqueous hydrochloric acid or aqueous nitric acid and the like. 在本发明的丙烯制造用催化剂的制造方法中，即使在第2工序对碱金属/铝原子比小于4的无粘合剂结晶硅酸铝进行了烧制之后，也可以添加碱金属成分，使得无粘合剂结晶硅酸铝的碱金属/铝原子比成为4〜200的范围内，再一次进行第2工序的烧制。  In the present invention, the propylene production method for producing a catalyst, even after the second step of the alkali metal / aluminum atomic ratio was fired binderless crystalline aluminosilicate is less than 4, may be added an alkali metal component, so that the adhesive-free crystalline aluminosilicate alkali / aluminum atomic ratio is in a range of 4~200, again the second firing step. 第2工序烧制时的无粘合剂结晶硅酸铝的碱金属/铝原子比小于4、通过第3工序将阳离子型制成质子型或铵离子型的丙烯制造用催化剂，丙烯合成反应的丙烯收率、寿命性能稍差，但通过添加碱金属成分使得上述丙烯制造用催化剂的碱金属/铝原子比成为4〜200的范围内，在碱金属成分的存在下再一次进行烧制，就能够使丙烯合成反应的丙烯收率提高，催化剂寿命也得以延长。 Binderless crystalline aluminosilicate during the second step of firing the alkali metal / aluminum atomic ratio of less than 4, by the third step an ionic ammonium type cationic acrylic prepared protic or producing catalyst, the synthesis reaction of propylene propylene yield, the life performance slightly inferior, but by adding an alkali metal component such that the propylene for producing an alkali metal catalyst / aluminum atomic ratio is in a range of 4~200, fired again in the presence of alkali metal components, it propylene synthesis reaction is possible to increase the propylene yield, catalyst life is also extended. 以无粘合剂结晶硅酸铝成型体的碱金属/铝原子比成为4〜200的范围内的方式添加碱金属成分，在碱金属成分的存在下进行烧制的工序，既可以在第2工序对碱金属/铝原子比小于4的无粘合剂结晶硅酸铝进行烧制之后进行，也可以通过第3工序将无粘合剂结晶硅酸铝成型体的阳离子型制成质子型或铵离子型之后进行，还可以在丙烯合成反应等的反应中使用，在判断反应性能稍差后进行。  In the adhesive-free alkali metal crystalline aluminosilicate molded body / aluminum atomic ratio of added alkali metal components be within a range of 4~200, a step of firing in the presence of an alkali metal component, either in the second step of the metal after the alkali / aluminum atomic ratio of firing the binderless crystalline aluminosilicate is less than 4, the third step can also be binderless crystalline aluminosilicate molded body made of a cationic proton type or ammonium ion type after, it may also be used in the synthesis reaction of propylene or the like, carried out after the reaction was judged less performance. 本发明的丙烯制造用催化剂能够通过进行如下的工序制造：在由红外分光分析在3715CHT1至3735CHT1的范围内所观察到的羟基的峰位置在3715(^1至3725(^1 (不包含3725cm-1)的范围内的无粘合剂结晶硅酸铝成型体中，添加碱金属成分使得上述无粘合剂结晶硅酸铝成型体的碱金属和铝的原子比，以碱金属/铝原子比表示成为4〜200的范围内，在碱金属成分的存在下进行烧制的工序；和将得到的无粘合剂结晶硅酸铝成型体的阳离子型制成质子型或铵离子型的工序。  Propylene manufactured according to the present invention, the catalyst can be by a step of manufacturing the following: a peak position of infrared spectroscopic analysis in the range 3715CHT1 to 3735CHT1 observed to hydroxyl groups in 3715 (^ 1-3725 (^ 1 (not binderless crystalline aluminosilicate molded body comprising in the range of 3725cm-1) is added alkali metal components so that the atomic ratio of the alkali metal and aluminum binderless crystalline aluminosilicate molded body to an alkali metal / Al atomic ratio is in a range of 4~200, the step of firing in the presence of an alkali metal component; and the obtained binderless crystalline aluminosilicate molded body made cationic proton type or ammonium ion type process. 由红外分光分析在3715CHT1至3735CHT1的范围内所观察到的结晶硅酸铝的峰位置在3715CHT1至3725(311^(不包含3725CHT1)的范围内的无粘合剂结晶硅酸铝成型体，例如，可以在第2工序中的无粘合剂结晶硅酸铝的碱金属/铝原子比小于4的情况或长时间进行丙烯合成反应而催化剂性能下降的情况等中观察到。即使在这样的情况下，也可以通过添加碱金属成分使得无粘合剂结晶硅酸铝成型体的碱金属/铝原子比成为4〜200的范围内，在碱金属成分的存在下进行烧制，而成为由红外分光分析在3715CHT1至3735CHT1范围内所观察到的结晶硅酸铝的峰位置在3725CHT1至3735CHT1范围内的无粘合剂结晶硅酸铝成型体，能够提高丙烯合成反应的丙烯收率，催化剂寿命也得以延长。 Binderless crystalline aluminosilicate molded within the scope of  infrared spectroscopic analysis in the range 3715CHT1 3735CHT1 to the observed peak position in the crystalline aluminosilicate 3715CHT1 to 3725 (311 ^ (without 3725CHT1) of body, for example, in the second step binderless crystalline aluminosilicate of alkali / aluminum atomic ratio is less than 4 or prolonged propylene synthesis reaction catalyst performance degradation and the like was observed. even in in such a case, by adding an alkali metal component such that the adhesive-free alkali metal crystalline aluminosilicate molded body / aluminum atoms in the range of 4~200, and fired in the presence of alkali metal component ratio becomes, and a crystalline aluminosilicate be in the range of infrared spectroscopic analysis to 3715CHT1 3735CHT1 observed peak position in the range 3725CHT1 to 3735CHT1 binderless crystalline aluminosilicate molded body can be enhanced yield of propylene propylene synthesis reaction, catalyst life is also extended. 在本发明中，能够在由上述记载的方法得到的丙烯制造用催化剂的存在下，从甲醇和/或二甲醚制造丙烯。  In the present invention, propylene can be produced from the above-described methods obtained by the presence of a catalyst, methanol and / or dimethyl ether manufactured from propylene. 在使用本发明的丙烯制造用催化剂合成丙烯的反应中，因为即使在原料中只使用甲醇，即使在原料中只使用二甲醚，生成的乙烯、丙烷、丙烯等的收率几乎相同，所以用于丙烯制造的原料中的甲醇和二甲醚的存在比例是任意的，既可以仅为甲醇，也可以仅为二甲醚。 In the reaction for producing propylene according to the present invention the catalyst synthesis of propylene, because even if only in the feedstock methanol, only the raw material used even in dimethyl ether, almost the same yield ethylene, propane, propylene, etc. generated, so use methanol and is present in the propylene feed ratio of dimethyl ether produced is arbitrary, may be methanol only, dimethyl ether may be only. 另外，在本发明中，能够在由上述记载的方法得到的丙烯制造用催化剂的存在下，从烯烃制造丙烯。  Further, in the present invention, it can be produced by the presence of a catalyst in producing propylene from a propylene-olefin obtained by the process described above. 例如，能够使用本发明的丙烯制造用催化剂，从I- 丁烯或异丁烯等碳原子数为4的烯烃、或I-己烯等碳原子数为6的烯烃原料合成丙烯(烯烃的异构化反应)。 For example, propylene can be used for producing the catalyst of the present invention, the number of carbon atoms, etc. I- butene or isobutene olefin of 4, carbon atoms or I- hexene as the olefin propylene synthesized 6 (olefin isomerization reaction). 在使用本发明的丙烯制造用催化剂从甲醇和/或二甲醚合成丙烯的反应中，副产丁烯、戊烯、己烯等烯烃。  In the present invention the olefin is propylene for producing catalyst from the reaction of methanol and / or dimethyl ether synthesis propylene, byproduct butene, pentene, hexene and the like. 在本发明中，因为能够在本发明的丙烯制造用催化剂的存在下，通过使副产的烯烃发生上述异构化反应而转化为丙烯，所以能够使过程整体的丙烯收率提闻。 In the present invention, since it is possible in the present invention for producing the propylene presence of a catalyst, the olefin by-produced by the above isomerization reaction is converted to propylene, it is possible to mention propylene yield overall process smell. 能够在异构化反应中使用的烯烃种类没有特别限定，但在包含MFI型晶体结构和/或MEL型晶体结构的无粘合剂结晶硅酸铝成型体存在下合成丙烯的反应中副产的烯烃，具有碳原子数为4〜8的烯烃多的特征，从反应物质向上述晶体结构的细孔内扩散的方面出发，优选碳原子数为4〜8的烯烃。  an olefin type can be used in the isomerization reaction is not particularly limited, but no binder comprising a crystalline MFI-type crystal structure and / or MEL type crystal structure of the aluminosilicate molded synthetic reaction in the presence of propylene byproduct olefins, olefins having a carbon number of 4 to 8 and more features, from the reaction mass in terms of pore diffusion of the crystal structure described above, the number of carbon atoms, preferably 4 to 8 olefins. 能够在异构化反应中使用的烯烃的来源没有特别限定，既可以是在从甲醇和/或二甲醚合成丙烯的反应中副产的烯烃，也可以是在烯烃的异构化反应中副产的烯烃，还可以是在石油脑分解等其他反应过程中生成的烯烃。  sources can be used in the isomerization reaction of olefins is not particularly limited, and may be in the reaction of methanol and / or dimethyl ether synthesis of propylene by-product olefins may be isomerized olefins in the reaction byproduct olefin may also be produced in other reactions such as decomposition of naphtha olefins process. 另外，既可以在精制过程中将烯烃精制后用于各烯烃成分，也可以如碳原子数为4〜8的烯烃馏分那样以各种烯烃混合的状态使用。 Further, each olefin components may be used in the refining process will be purified olefins, such as may be 4 to 8 carbon atoms as the olefin fraction in various olefins using a mixed state. 异构化反应既可以由异构化反应专用的反应装置进行，或者也可以由从甲醇和/或二甲醚合成丙烯的反应装置，与从甲醇和/或二甲醚合成丙烯的反应同时进行。 The isomerization reaction may be dedicated to the isomerization reaction by the means for both, or may be, simultaneously with the reaction of methanol and / or dimethyl ether synthesis from propylene by methanol and / or dimethyl ether synthesis reaction apparatus propylene . 因此，本发明的丙烯的制造方法是在上述记载的丙烯制造用催化剂的存在下，从甲醇和/或二甲醚制造丙烯的方法；是在上述记载的丙烯制造用催化剂的存在下，从选自碳原子数为4〜8的烯烃中的至少I种烯烃制造丙烯的方法；是在上述记载的丙烯制造用催化剂的存在下，从包含选自甲醇、二甲醚和碳原子数为4〜8的烯烃中的I种或2种以上的原料制造丙烯的方法。  Thus, the method for producing propylene according to the invention is described above in the manufacture of propylene with a catalyst is present, or from the methods and methanol / dimethyl ether producing propylene; propylene production is used in the above-described presence of a catalyst at least I olefin process for producing propylene from olefins of 4 to 8 carbon atoms selected number; in the manufacture of propylene with the above described catalyst is present, selected from, dimethyl ether and the number of carbon atoms comprising methanol 4 to 8 of the olefins to methods I or more kinds of raw materials for producing propylene. 在本发明的丙烯的制造方法中，可以不稀释地直接在丙烯合成反应中使用选自甲醇、二甲醚和碳原子数为4〜8烯烃中的I种或2种以上的原料，但以氦、氮、氩、水蒸气等稀释进行丙烯合成反应，因为丙烯收率变得更高，故而优选。  In the method for producing propylene according to the present invention may be used without dilution directly selected from methanol synthesis reaction of propylene, dimethyl ether and carbon atoms, 4 to 8 or more kinds of olefins I or kinds of raw materials but helium, nitrogen, argon, water vapor, dilution of propylene synthesis reaction becomes higher because the yield of propylene, and therefore preferable. 另外，在稀释气体中即使使用几乎不发生丙烯合成反应的乙烯或碳原子数为2〜8范围的链烷烃，丙烯收率也会变得更高，故而优选。 Further carbon atoms or an ethylene, propylene synthesis reaction hardly occurs even in the diluent gas used in a range of 2~8 paraffins, propylene yield also becomes higher, which is preferable. 此时，甲醇、二甲醚和碳原子数为4〜8的烯烃的原料浓度的总和（体积％，V01%)在25%〜100%的范围内是适当的。 In this case, methanol, dimethyl ether, and the sum of carbon atoms of 4 to 8 olefin material concentration (vol%, V01%) in the range of 25% ~ 100% is appropriate. 另外，稀释气体既可以单独使用，也可以混合2种以上使用。 Further, the diluent gas may be used alone, or two or more may be mixed and used. 本发明的丙烯的制造的反应形式没有特别限定，可以以任意的反应形式进行。  The reaction for producing propylene form of the present invention is not particularly limited, the reaction may be performed in any form. 例如,可以以固定床气相流通式反应形式、流动层反应形式进行。 For example, a fixed bed flow reactor in the form of a gas phase, fluidized bed reaction forms. 固定床气相流通式时,能够使用绝热式、多管热交换式、中间热交换-多段绝热式、原料中间供给-多段绝热式、自热交换式等的反应器。 When a fixed bed gas phase flow type, it is possible to use adiabatic, multi-tube type heat exchanger, the intermediate heat exchanger - multistage adiabatic intermediate raw material supply - multistage adiabatic self-heat exchange type reactor. 反应温度没有特别限定，但从丙烯合成反应的丙烯收率的方面出发，优选4000C〜600°C范围内的温度，更优选450°C〜550°C范围内的温度。 The reaction temperature is not particularly limited, but in terms of the yield of propylene Propylene synthesis reaction starting temperature in the range of preferably 4000C~600 ° C, and more preferably a temperature in the 450 ° C~550 ° C range. 反应压力没有特别限定，以绝对压力，优选O. OlMPa〜IOMPa范围内的压力，更优选O. 05MPa〜IMPa范围内的压力。 The reaction pressure is not particularly limited, and absolute pressure, pressure in the range of O. OlMPa~IOMPa preferred, more preferably a pressure in the range O. 05MPa~IMPa. 原料的供给速度以重量空间速度（WHSV)表示，优选O. Ihf1〜ZOhr—1的范围内，更优选O. 5hr^〜IOhf1的范围内。 Feed rate of the raw material at a weight space velocity (WHSV) indicates, preferably in the range of O. Ihf1~ZOhr-1, and more preferably in a range of O. 5hr ^ ~IOhf1. 其中，重量空间速度（WHSV)表示每单位催化剂重量在单位时间中的原料的供给重量。 Wherein the weight space velocity (WHSV) indicates the weight per unit weight of the material supplied to the catalyst in the unit time. 在本发明的丙烯的制造中使用的催化剂的形状没有特别限定，例如，可以直接使用以球状、椭圆状、圆柱状、环状、板状、片状、蜂窝状、花瓣状等形状合成的无粘合剂结晶硅酸铝成型体。  The shape of the catalyst used in the production of propylene according to the invention is not particularly limited, for example, may be used directly in spherical, elliptical, cylindrical, ring, plate, sheet, honeycomb shape and the like petaloid synthetic crystalline aluminosilicate binder-free shaped bodies. 另外，也可以将无粘合剂结晶硅酸铝成型体作为原料，制成适当形状的压片成型体，在丙烯合成反应中使用。 Further, the adhesive may be non-crystalline aluminosilicate molded as a starting material, suitably shaped molded tablet, used in the synthesis reaction of propylene. 催化剂的尺寸也没有特别限定，可以根据反应形式使用适当尺寸的无粘合剂结晶硅酸铝成型体，也可以根据需要再进行加工。 Size of the catalyst is not particularly limited, and may be used depending on the reaction in the form of appropriately sized crystalline aluminosilicate binder-free shaped bodies, may be further processed as required. 由以下的实施例具体地说明本发明，但本发明不受这些实施例限定。  from the following examples illustrate the present invention, but the present invention is not limited to these examples. 在本发明的实施例、比较例中，丙烯制造用催化剂的物性、反应性能如下操作进行测定。  In an embodiment of the present invention and Comparative Examples, physical properties of the propylene producing, the reaction performance of the catalyst was measured as follows. 无粘合剂结晶硅酸铝成型体的晶体结构分析和结晶度的测定由粉末X射线衍射法（XRD)进行。  Determination of binderless crystalline aluminosilicate structural analysis and crystallinity crystal molded by powder X-ray diffraction (XRD). XRD测定使用在玛瑙乳钵内粉碎并在设定于110°C的干燥器内进行干燥处理过的试样来进行，使用规定重量的试样进行。 XRD measurement using pulverized in an agate mortar and dried sample treated in a dryer set at 110 ° C is carried out using a predetermined weight of a sample is performed. X射线衍射的测定，使用株式会社Mac science(现BrukerAXS株式会社)生产的粉末X射线衍射装置M18XCE，使用Cuk α线（].54056人)作为X射线源，以2Θ=2°〜54°的范围进行。 X-ray diffraction using Corporation Mac science (now BrukerAXS Corporation) produced a powder X-ray diffractometer M18XCE, using Cuk α line (] .54056 al.) As an X-ray source to 2Θ = 2 ° ~54 ° to range. 晶体结构从2 Θ =2°〜54°的范围内的峰图谱确定。 Crystal structure determined from the map of the Peak 2 Θ = 2 ° ~54 ° range. 测定在2 Θ =23.0°〜23. 3°的范围内出现的峰强度，以UOP公司生产的MFI-300粉末（SiO2Al2O3摩尔比=300，Si/Al比=150)的峰强度为基准，以相对比（％)来表示结晶度。 Measuring a peak intensity appearing in the range of 2 Θ = 23.0 ° ~23. 3 ° to UOP produced MFI-300 powder (SiO2Al2O3 molar ratio = 300, Si / Al ratio = 150) peak intensity of a reference to relative ratio (%) to indicate the degree of crystallinity. 另外，MFI型在2 Θ =23.0°〜23. 3°的范围内出现的峰对应（051)面或（501)面，MEL型在2 Θ =23.0°〜23. 3°的范围内出现的峰对应（501)面。 Further, the peak corresponding to the MFI-type appears in the range of 2 Θ = 23.0 ° ~23. 3 ° of the (051) plane or (501) plane, MEL type in the range of 2 Θ = 23.0 ° ~23. 3 ° appearing peaks corresponding to (501) plane. 在无粘合剂结晶硅酸铝成型体中包含的硅、铝、碱金属的定量分析通过ICP发光分光分析(高频电感耦合等离子体发光分光分析法：ICP_AES、ICP-0ES)进行。  aluminum silicon, aluminum, quantitative analysis of the alkali metal contained in the molded adhesive-free crystals by ICP emission spectrometry (high-frequency inductively coupled plasma emission spectroscopy: ICP_AES, ICP-0ES) for . 试样使用在玛瑙乳钵内粉碎并在设定于110°C的干燥器内进行干燥处理过的试样，在临测定前，使用60%硝酸(微量分析用)和40% HF (微量分析用），由微波分解将试样溶解，再由纯水稀释到适当的浓度，供给ICP发光分光分析。 The sample was pulverized using an agate mortar and dried sample treated in a dryer set at 110 ° C, and immediately before assay, with 60% nitric acid (trace analysis) and 40% HF (Microanalysis a), by a microwave decomposition sample dissolution, and then diluted with water to a suitable concentration, supplied to ICP emission spectrometry. 微波分解使用Milestone-general株式会社生产的微波试样前处理装置ETHOS I、TFM高压分解容器HPV-100进行。 Microwave decomposition using Milestone-general KK microwave sample pretreatment apparatus ETHOS I, TFM high pressure decomposition container for HPV-100. ICP发光分光分析，使用Varian Technologies Japan Ltd.生产的ICP 发光分光分析装置VISTA-PR0 进行。 ICP emission spectroscopic analysis using Varian Technologies Japan Ltd. production ICP emission spectroscopic analysis apparatus for VISTA-PR0. <丙烯制造用催化剂的反应性能分析>  丙烯合成反应的性能试验使用具备原料储槽、原料供给泵、原料气体导入装置、不活泼气体导入装置、反应管(石英玻璃制或SUS316制，内径15·ιΦ、长300mm)、冷却装置、反应生成气体捕集装置等的固定床气相流通式反应装置进行。  <propylene-producing reaction catalyst performance analysis> Performance Test Using  Propylene synthesis reaction includes a feed tank, feed supply pump, the raw material gas introduction means, an inert gas introducing means, the reaction tube (made of quartz glass or of SUS316, inner diameter of 15 · ιΦ, length 300mm), a cooling device, generates a reaction gas trapping device or the like fixed-bed gas-phase flow reactor apparatus. 反应效果以在气相色谱中在线导入反应生成气体进行定量分析求出。 In order to effect the reaction gas introduced into the reaction product gas chromatography quantitative analysis obtained online. 在原料中使用甲醇或二甲醚时的甲醇转化率、二甲醚转化率分别由下式计算。 Conversion of methanol, dimethyl ether conversion rates were calculated by the following formula when using methanol or dimethyl ether in the feedstock. 另外，在反应中生成的烃化合物的收率，将在反应中生成各个烃中的碳的摩尔数除以用作原料的甲醇中或二甲醚中的碳的摩尔数，再乘100而求出。 Moles of  Furthermore, the yield of hydrocarbon compounds produced in the reaction, and the resulting carbon in various hydrocarbon used as a feedstock in the reaction divided by the methanol or dimethyl ether, carbon, and then by 100 to obtain. 例如，丙烯收率由下式计算。 For example, the yield of propylene is calculated by the following formula. 在用于合成本发明的实施例、比较例的丙烯制造用催化剂的原料、试剂中，代表性的原料、试剂表示如下。  In an embodiment of the present invention for the synthesis of propylene manufactured using the catalyst of Comparative Example starting material, reagent, representative starting materials, reagents shown below. (I) 二氧化硅载体=CARiACT (注册商标)、品名Q-50、公称粒径8〜14mesh、富士silysia化学株式会社生产。  (I) a silica support = CARiACT (registered trademark), Name Q-50, the nominal particle diameter 8~14mesh, Fuji silysia Chemical Corporation. 试验分析值：比表面积71m2/g、细孔容积0. 98ml/g、填充密度0. 42g/ml、pH8. O、干燥减重0. 5%、平均细孔径47. 9nm。 Experimental Analysis Found: specific surface area of ​​71m2 / g, a pore volume of 0. 98ml / g, the packing density of 0. 42g / ml, pH8 O, drying loss 0.5%, an average pore diameter 47. 9nm. (2)四丙基氢氧化铵40%水溶液：Sachem株式会社生产、制品编号746。  (2) tetrapropyl ammonium hydroxide, 40% aqueous solution: Sachem Co., Ltd., product number 746. 试验分析值：Assay=40. 56wt %、K+Na 含量=3ppm。 Test Found: Assay = 40 56wt%, K + Na content = 3ppm..
 (4)硝酸铝· 9水合物：关东化学株式会社生产、Cat. No. 01170-00、特级。  (4) of aluminum nitrate 9-hydrate *: produced by Kanto Chemical Co., Cat No. 01170-00, grade. (5)0. 5mol/L氢氧化钾溶液（N/2):关东化学株式会社生产、Cat. No. 32847-08。  (5) 0 5mol / L potassium hydroxide solution (N / 2):. By Kanto Chemical Co., Ltd., Cat No. 32847-08..
 (6)氢氧化钾：关东化学株式会社生产、Cat. No. 32344-00、特级、纯度86. 0%。  (6) Potassium hydroxide: produced by Kanto Chemical Co., Cat No. 32344-00, grade, purity 86.0%. (7)氯化钾：和光纯药工业株式会社生产、Cat. No. 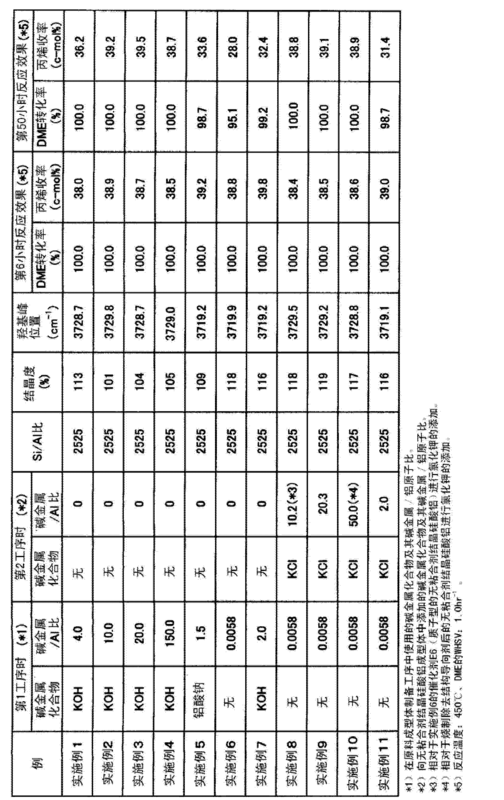 163-03545、试剂特级。  (7) KCl: Wako Pure Chemical Industries, Ltd., Cat No. 163-03545, special grade reagent. (8)铝酸钠：关东化学株式会社生产、Cat. No. 37095-01、鹿I级。  (8) sodium aluminate: produced by Kanto Chemical Co., Cat No. 37095-01, deer I level. Al2O3含量=36. 5质量％、Na2O含量=33. O质量％、Na20/Al203摩尔比=约I. 5。 Al2O3 content = 36.5 mass%, Na2O content = 33. O mass%, Na20 / Al203 molar ratio = about I. 5. 在33. Og纯水中溶解O. 0495g硝酸铝·9水合物，在该溶液中使20. Og 二氧化硅载体CARiACT(注册商标)Q-50含浸2小时。  O. 0495g of aluminum nitrate were dissolved 6.9 hydrate 33. Og of pure water, the solution to a silica support CARiACT 20. Og (registered trademark) Q-50 is impregnated for 2 hours. 使用旋转式蒸发器，在70〜80°C的加热下减压蒸馏除去水分，再在80°C的干燥器中使之干燥15小时，得到载持有硝酸铝的二氧化硅载体。 Using a rotary evaporator, heated at 70~80 ° C water was distilled off under reduced pressure, and then dried 15 hours in a dryer of manipulation to 80 ° C, to obtain a silica-carrying support of aluminum nitrate. 接着，在以23. Og纯水稀释10. 02g Sachem株式会社生产的四丙基氢氧化铵40%水溶液(制品编号746)和I. 06g O. 5mol/L氢氧化钾溶液得到的溶液中，使载持有上述硝酸铝的二氧化硅载体含浸2小时。 Next, the dilution 10. 02g Sachem KK to 23. Og water tetrapropyl ammonium hydroxide, 40% aqueous solution (product number 746) and I. 06g O. 5mol / L potassium hydroxide solution to give a solution, silica-carrying support of the aluminum nitrate impregnated for 2 hours. 然后，使用旋转式蒸发器，在70〜80°C的加热下减压蒸馏除去水分，再在80°C的干燥器中使之干燥I小时，得到由载持有硝酸铝、氢氧化钾和四丙基氢氧化铵的成分的二氧化硅载体构成的原料成型体。 Then, using a rotary evaporator, water was removed by distillation under reduced pressure under heating at 70~80 ° C, and then dried in a dryer I hour to 80 ° C manipulation, the carrier holding the obtained aluminum nitrate, and potassium hydroxide silica support tetrapropyl ammonium hydroxide component body made of molded material. 组成分析的结果，以氧化物形式记载各成分的组成式来表示，该原料成型体的组成比为O. 060TPA0HU. 0Si02、0. 000198A1203、0. 0008M20,Si/Al比为2525，碱金属/铝原子比为4.0。 Result of composition analysis, the composition according to the formula in the form of an oxide of each component is represented, the composition of the raw molded body ratio O. 060TPA0HU. 0Si02,0. 000198A1203,0. 0008M20, Si / Al ratio of 2525, an alkali metal / aluminum atomic ratio of 4.0. 其中，TPAOH表示四丙基氢氧化铵，M表示碱金属，以下，在本发明的说明书中同样地记载。 Wherein, represents of TPAOH tetrapropylammonium hydroxide, M is an alkali metal, or less, in the same manner described in the description of the present invention. 在不锈钢制的筐中加入25. 2g上述原料成型体，在底部加入有7. Og纯水的带有SUS304夹套的特氟龙（Teflon，注册商标）坩埚（内容积100ml)内，以原料成型体不与纯水接触的方式设置。  25. 2g added to the raw material in the molded casing made of stainless steel, Teflon was added at the bottom (a Teflon, registered trademark) of the crucible (volume 100ml) SUS304 with the pure water jacket 7. Og , raw molded body in a manner not in contact with water is provided. 密闭上述带有夹套的特氟龙(注册商标)坩埚，在温度160°C的干燥器中进行10小时加热处理，使原料成型体接触饱和水蒸气的气氛。 Above the sealed Teflon (registered trademark) crucible with a jacket, a heat treatment for 10 hours in a drier at a temperature of 160 ° C, the molded body contacting the feedstock in an atmosphere of saturated steam. 升温时间设为6小时。 Warm-up time is 6 hours. 冷却到室温后，以110°C使得到的白色固体干燥5小时。 After cooling to room temperature, 110 ° C The resulting white solid was dried for 5 hours. 该白色固体的粉末X射线衍射的结果，可知为结晶性良好的MFI型晶体结构，能够合成无粘合剂结晶硅酸铝成型体。 The white solid powder X-ray diffraction analysis, it was found good crystalline MFI-type crystal structure can be synthesized crystalline aluminosilicate binderless shaped body. 另外，组成分析的结果，上述无粘合剂结晶硅酸铝成型体的碱金属/铝原子比，与原料成型体相同为4. O。 Further, the results of the composition analysis of the binderless crystalline aluminosilicate alkali metal molded body / aluminum atomic ratio, and the same material as the molded body 4. O. 在空气气流中以550°C烧制该无粘合剂结晶硅酸铝成型体4小时，得到19. 8g白色固体。  stream of air at 550 ° C firing the binderless crystalline aluminosilicate molded for 4 hours to give 19. 8g as a white solid. 在70°C的2mol/L氯化铵水溶液中含浸该白色固体2小时，进行铵离子交换。  The white solid was impregnated for 2 hours at 2mol / L aqueous solution of ammonium chloride in 70 ° C, for ammonium ion exchange. 重复3次离子交换，清洗到氯化物离子不再被硝酸银水溶液检出为止。 Ion exchange was repeated three times, washed to chloride ion is no longer detected until the aqueous silver nitrate solution. 然后，以110°C将固体干燥5小时，再在空气气流中在550°C烧制4小时，得到丙烯制造用催化剂El (催化剂El )。 Then, the solid was dried 110 ° C for 5 hours and then calcined at 550 ° C for 4 hours in an air stream, to obtain a propylene El producing catalyst (catalyst El). 催化剂El的形状、尺寸维持原料中使用的二氧化硅载体CARiACT (注册商标)Q-50的形状和尺寸，粉末X射线衍射的结果，结晶度为113%，可知催化剂El是结晶性良好的MFI型晶体结构的无粘合剂结晶硅酸铝成型体。  El catalyst shape, size silica support is maintained CARiACT (registered trademark) material used in the shape and size of Q-50, the result of powder X-ray diffraction crystallinity of 113%, the catalyst is a crystalline El good binderless MFI-type crystal structure of crystalline aluminosilicate molded. 组成分析的结果，Si/Al比为25/25。 Result of composition analysis, Si / Al ratio was 25/25. 未检出碱金属，可知被铵离子交换除去。 Not detected an alkali metal, an ammonium ion exchange can be seen to be removed. 红外分光分析的结果，在3715CHT1至3735CHT1的范围内所观察到的羟基的峰位置为3728. 7cm-10原料流通开始后第6小时的丙烯合成反应的效果为二甲醚转化率100%、丙烯收率38. Oc-mol % ，原料流通开始后第50小时的效果为二甲醚转化率100. O %、丙烯收率36. 2c-mol%，性能良好。 Infrared spectroscopic analysis of the results, the peak position in the range 3715CHT1 3735CHT1 to the observed effect is hydroxyl 3728. Synthesis of propylene feed flow 7cm-10 6 hours after the start of the conversion is 100% dimethyl ether, propylene yield 38. Oc-mol%, the effect of the feed flow 50 hours after the start of DME conversion 100. O%, a propylene yield 36. 2c-mol%, good performance. 改变在实施例I的原料成型体制备工序中使用的氢氧化钾的使用量，将原料成型体的碱金属/铝原子比和在第2工序的碱金属成分存在下的烧制工序中的无粘合剂结晶硅酸铝成型体的碱金属/铝原子比设为10. 0、20. O、150.0，除此以外，全部与实施例I同样操作，得到丙烯制造用催化剂(催化剂E2、催化剂E3、催化剂E4)。  Changes in amount of potassium hydroxide used in the molding material preparation step of Example I, the alkali metal of the molded material / aluminum atomic ratio and the firing step in the presence of an alkali metal component in the second step the adhesive-free crystalline alkali metal aluminosilicate molded body / aluminum atomic ratio is set to 10. 0,20. O, 150.0, except that all the same manner as in Example I to yield propylene production catalyst (catalyst E2, E3 catalyst, the catalyst E4). 各催化剂的Si/Al比、结晶度、羟基的峰位置、丙烯合成反应的效果在表I中汇总记载。 Each catalyst Si / Al ratio, crystallinity, the peak position of the hydroxyl group, the synthesis reaction of propylene effects described are summarized in Table I below. 在实施例I中，取代硝酸招·9水合物使用O. 0184g招酸钠,不使用O. 5mol/L氢氧化钾溶液，除此以外，全部与实施例I同样操作，得到丙烯制造用催化剂E5(催化剂E5)。  In Example I, nitric trick-substituted 9-hydrate used O. 0184g sodium move, without using O. 5mol / L potassium hydroxide solution, except that all the same manner as in Example I, to give a propylene E5 producing catalyst (catalyst E5). 此时，原料成形体的碱金属/铝原子比、和在第2工序的碱金属成分存在下的烧制工序中的无粘合剂结晶硅酸铝成型体的碱金属/铝原子比，组成分析的结果都为I. 5。 In this case, the molded material alkali / aluminum atomic ratio, and a step of firing the binderless crystalline alkali metal component of the second step in the presence of an alkali metal silicate molded body / aluminum atomic ratio, composition the results of the analysis are I. 5. 催化剂E5的形状、尺寸与在原料中使用的二氧化硅载体CARiACT (注册商标）Q-50的形状相同，粉末X射线衍射的结果，结晶度为109%，催化剂E5是结晶性良好的MFI型晶体结构的无粘合剂结晶硅酸铝成型体。 E5 shape of the catalyst, the size of the silica support CARiACT (registered trademark) used in the raw materials of the same shape as Q-50, the results of powder X-ray diffraction crystallinity of 109%, E5 catalyst is a crystalline MFI-type well no crystal structure of the crystalline aluminosilicate binder molded. 组成分析的结果，Si/Al比为2525，未检出碱金属。 Result of composition analysis, Si / Al ratio of 2525, an alkali metal not detected. 红外分光分析的结果，在3715CHT1至3735CHT1的范围内所观察到的羟基的峰位置为3719. 2cm^0原料流通开始后第6小时的丙烯合成反应的效果为二甲醚转化率100%、丙烯收率39. 2C-m0l%，但原料流通开始后第50小时的效果为二甲醚转化率98. 7%、丙烯收率33. 6c-mol%，相比于原料流通开始后第6小时，可知性能稍微下降。 Infrared spectroscopic analysis of the results, the peak position in the range 3715CHT1 3735CHT1 to the hydroxyl group was observed 3719. 2cm ^ 0 the feed flow effect 6 hours after start of the synthesis reaction of propylene conversion rate was 100% dimethyl ether, propylene yield 39. 2C-m0l%, but the first 50 hours after the start of the feed flow effect DME conversion 98.7%, the yield of propylene 33. 6c-mol%, compared with the first 6 hours after start of the feed flow , it found that the performance is slightly decreased. 在实施例I中，不使用O. 5mol/L氢氧化钾溶液，除此以外，全部与实施例I同样操作，得到丙烯制造用催化剂E6。  In Example I, without using O. 5mol / L potassium hydroxide solution, except that all the same manner as in Example I, to give a catalyst for producing the propylene E6. 此时，原料成型体的碱金属/铝原子比、在第2工序的碱金属成分存在下的烧制工序中的无粘合剂结晶硅酸铝成型体的碱金属/铝原子比，组成分析的结果都为O. 0058。 In this case, the alkali metal of the molded material / aluminum atomic ratio, in the presence of adhesive-free crystalline alkali metal component of the second step of the firing step in the alkali metal silicate molded body / aluminum atomic ratio, composition analysis the results are O. 0058. 催化剂E6的Si/Al比、结晶度、羟基的峰位置、丙烯合成反应的效果在表I中汇总记载。 Catalyst E6, Si / Al ratio, crystallinity, the peak position of the hydroxyl group, the synthesis reaction of propylene effects described are summarized in Table I below. 与实施例6的原料成型体制备同样，不使用在实施例I的原料成型体制备工序中使用的O. 5mol/L氢氧化钾溶液，得到由载持有硝酸铝和四丙基氢氧化铵的成分的二氧化硅载体构成的原料成型体。  Example 6 with the feed system forming apparatus of the same embodiment, is not used in the preparation O. molding step using starting material in Example I 5mol / L potassium hydroxide solution, to give a carrier holding aluminum nitrate and tetrapropyl a silica carrier material molded component consisting of ammonium hydroxide. 组成分析的结果，将各成分以氧化物形式记载的组成式来表示，该原料成型体的组成比为O. 060TPA0HU. 00Si02、0. 0001980Α1203、0· 00000120M20, Si/Al 比为2525，碱金属/铝原子比为O. 0058。 Result of composition analysis, the composition of the ingredients according to the formula represented in the form of oxide, the composition of the raw molded body ratio O. 060TPA0HU. 00Si02,0. 0001980Α1203,0 · 00000120M20, Si / Al ratio of 2525, an alkali metal / Al atomic ratio of O. 0058. 与实施例I的第I工序同样地进行无粘合剂结晶硅酸铝成型体的合成工序，得到浅茶白色固体。 The same procedure of Step I of Example I binderless crystalline aluminosilicate molded synthetic step, to give a pale brownish white solid. 粉末X射线衍射的结果，该浅茶白色的固体是结晶性良好的MFI型的晶体结构，可知不能合成无粘合剂结晶硅酸铝成型体。 The results of powder X-ray diffraction, the light tea white crystalline solid having excellent MFI type crystal structure, can not be seen without binder synthetic crystalline aluminosilicate molded. 在33. Og纯水中溶解有O. 20g氯化钾的氯化钾水溶液中含浸22. Sg上述浅茶白色的固体2小时，然后，使用旋转式蒸发器在70〜80°C的加热下减压蒸馏除去水分，再以110°C干燥5小时，得到载持有氯化钾的无粘合剂结晶硅酸铝成型体。 33. Og water in O. aqueous potassium chloride solution by dissolving 20g of potassium chloride in the above impregnating 22. Sg pale brown white solid was 2 hours and then using a rotary evaporator under heating to 70~80 ° C water was distilled off under reduced pressure, and then dried for 5 hours at 110 ° C, to obtain adhesive-free potassium-carrying molded crystalline aluminosilicate. 组成分析的结果，在此时刻的无粘合剂结晶硅酸铝成型体的碱金属/铝原子比为20. 3。 Composition analysis, at this point binderless crystalline aluminosilicate molded alkali metal / aluminum atomic ratio of 20.3. 另外，上述成型体含有作为结构导向剂成分的四丙基铵离子。 Further, the molded body containing the tetrapropyl ammonium ion component as structure-directing agent. 在空气气流中以550°C将该载持有氯化钾的成型体烧制4小时，得到19. 7g白色的固体，然后，与实施例I的第3工序同样地进行离子交换，得到丙烯制造催化剂E9 (白色固体)。 In an air stream at 550 ° C the chloride-carrying molded bodies were fired for 4 hours to give a white solid 19. 7g, and then, ion-exchanged in the same manner with the third step of Example I, to give a propylene The catalyst for producing E9 (white solid). 催化剂E9的Si/Al比、结晶度、羟基的峰位置、丙烯合成反应的效果在表I中汇总记载。 The catalyst E9, Si / Al ratio, crystallinity, the peak position of the hydroxyl group, the synthesis reaction of propylene effects described are summarized in Table I below. 与实施例9同样地进行原料成型体的制备和第I工序，得到无粘合剂结晶硅酸铝成型体。  Example 9 was prepared in the same manner and Process I material molded to obtain molded binderless crystalline aluminosilicate. 接着，与实施例9不同，不进行氯化钾的载持而在空气气流中以550°C将上述成型体烧制4小时，除去结构导向剂成分的四丙基铵离子。 Next, unlike the embodiment 9, not supporting potassium chloride at 550 ° C and the molded body will be fired in an air stream for 4 hours to remove tetrapropyl ammonium ion component of the structure directing agent. 组成分析的结果，在此时刻的无粘合剂结晶硅酸铝成型体的碱金属/铝原子比与原料成型体同样为O. 0058。 Composition analysis, at this point of the binder-free alkali metal crystalline aluminosilicate molded body / aluminum atomic ratio of the starting material was similarly molded O. 0058. 在该无粘合剂结晶硅酸铝成型体中，以碱金属/铝原子比为50. O的方式载持氯化钾。 In the molded binderless aluminosilicate crystal, alkali metal / aluminum atomic ratio of 50. O chloride supported manner. 在空气气流中以400°C将载持有氯化钾的成型体烧制4小时，然后，与实施例I的第3工序同样地进行离子交换，得到丙烯制造催化剂E10。 In an air stream at 400 ° C the chloride-carrying molded bodies were fired for 4 hours and then, with a third step in the same manner as Example I ion exchange catalyst to obtain propylene production E10. 催化剂ElO的Si/Al比、结晶度、羟基的峰位置、丙烯合成反应的效果在表I中汇总记载。 The catalyst ElO a Si / Al ratio, crystallinity, the peak position of the hydroxyl group, the synthesis reaction of propylene effects described are summarized in Table I below. 实施例11 在实施例9中，改变氯化钾的载持量，将无粘合剂结晶硅酸铝成型体的碱金属/铝原子比设为2. 0，除此以外，全部与实施例9同样操作，得到丙烯制造用催化剂E11。  Example 11  In the supporting amount in Example 9, the change of potassium chloride, the adhesive-free crystalline alkali metal aluminosilicate molded body / aluminum atomic ratio is set to 2.0, In addition Other than that, the same operation as in Example 9, to obtain the catalyst for producing the propylene E11. 催化剂Ell的Si/Al比、结晶度、羟基的峰位置、丙烯合成反应的效果在表I中汇总记载。 Ell of catalyst Si / Al ratio, crystallinity, the peak position of the hydroxyl group, the synthesis reaction of propylene effects described are summarized in Table I below. 从在表I中记载的实施例I〜11的结果可知，通过对特定的碱金属成分量、即碱金属/铝原子比在4〜200的范围内的无粘合剂结晶硅酸铝成型体进行烧制，可以得到丙烯合成反应的丙烯收率和催化剂寿命更为优异的丙烯制造用催化剂。  From the results of Example I~11 described in Table I shows that by a specific amount of alkali metal components, i.e., the alkali metal / aluminum atomic ratio in the range of 4~200 binderless the crystalline silicate firing the molded body of aluminum, the synthesis reaction of propylene can be obtained propylene yield and catalyst life more excellent catalyst for propylene production. 还可知碱金属成分量和红外分光光谱的峰的位置对应。 Also found that the amount of alkali metal component and infrared spectroscopic spectrum peak corresponding position. 可知碱金属成分既可以在原料成型体的制备工序中使用，也可以在使原料成型体接触饱和水蒸气而得到的无粘合剂结晶硅酸铝成型体中添加，还可以在除去了结构导向剂成分的无粘合剂结晶硅酸铝成型体中添加。 Found that the alkali metal component may be used in the preparation of a raw molded body, the molded body may be aluminum added in the raw material in contact with saturated steam and molded body obtained binderless crystalline, it may also be removed in the guide structure no adhesive agent component of the crystalline aluminosilicate is added in the molded article. 另外，可知即使对于由于在制造催化剂时不使用碱金属成分而反应性能稍差的催化剂，通过在上述范围内的碱金属成分存在下进行烧制，也能够赋予优异的反应性能。 Further, it was found even for the alkali metal component is not used in the manufacture of the catalyst and the reaction catalyst is less performance, fired by the presence of an alkali metal component in the above range, it is possible to impart excellent reactivity. 实施例12〜17例示了碱金属化合物的种类、原料成型体的制备方法、第I工序的加热处理条件。  12~17 Example illustrates the kind of alkali metal compound, preparing a raw material of the molded article, the heat treatment conditions of Example I step. 表2汇总了在实施例的第I工序和第2工序中的碱金属化合物的种类和使用量(碱金属/铝原子比)、丙烯制造用催化剂的Si/Al比、结晶度、红外分光分析的羟基的峰位置、丙烯合成反应试验的结果。 Table 2 summarizes the kind and amount of alkali metal compound in Process I, and a second step of embodiment (alkali metal / aluminum atomic ratio), propylene producing Si catalyst / Al ratio, crystallinity, infrared spectroscopic analysis peak position hydroxyl group, a propylene synthesis reaction test results. 反应试验与在表I中记载的实施例同样地进行。 Reaction Test Example described in Table I in the same manner. 在实施例I中，取代O. 5mol/L氢氧化钾溶液使用O. 112g氯化钾(和光纯药工业株式会社生产、Cat. No. 127-01165、试剂特级)，将第I工序的加热处理条件设为180°C、10小时，除此以外，全部与实施例I同样操作，得到丙烯制造用催化剂E12。  In Example I, a substituted O. 5mol / L potassium hydroxide solution using O. 112g of potassium chloride (Wako Pure Chemical Industries, Ltd., Cat. No. 127-01165, reagent special grade), the first I step heat treatment conditions to 180 ° C, 10 h, except all the same manner as in Example I, to give a catalyst for producing the propylene E12. 在第I、第2工序中的碱金属/铝原子比、催化剂E12的Si/Al比、结晶度、羟基的峰位置、丙烯合成反应的效果在表2中汇总记载。 In Group I, the second step is an alkali metal / aluminum atomic ratio, and E12 catalyst Si / Al ratio, crystallinity, the peak position of the hydroxyl group, the synthesis reaction of propylene effects described are summarized in Table 2. 在实施例I中，取代O. 5mol/L氢氧化钾溶液使用O. 267g硝酸钾(和光纯药工业株式会社生产、Cat. No. 160-04035、试剂特级)，将第I工序的加热处理条件设为120°C、30小时，除此以外，全部与实施例I同样操作，得到丙烯制造用催化剂E13。  In Example I, a substituted O. 5mol / L potassium hydroxide solution using O. 267g of potassium nitrate (Wako Pure Chemical Industries, Ltd., Cat. No. 160-04035, reagent special grade), the first step I the heat treatment conditions to 120 ° C, 30 h, except all the same manner as in Example I, to give a catalyst for producing the propylene E13. 在第I、第2工序中的碱金属/铝原子比、催化剂E13的Si/Al比、结晶度、羟基的峰位置、丙烯合成反应的效果在表2中汇总记载。 In Group I, the second step is an alkali metal / aluminum atomic ratio of the catalyst E13 Si / Al ratio, crystallinity, the peak position of the hydroxyl group, the synthesis reaction of propylene effects described are summarized in Table 2. 搅拌混合20. Og日本AER0SIL株式会社生产的二氧化硅粉末（AER0SIL(注册商标）200粉末)、10. 02g Sachem株式会社生产的四丙基氢氧化铵40%水溶液(制品编号746)、O. 0415g硫酸铝·14〜18水合物(关东化学株式会社生产、Cat. No. 01186-00、鹿特级）的水溶液、5. 28g O. 5mol/L氢氧化钠溶液（N/2)(关东化学株式会社生产、Cat. No. 37848-08)，制备白色的沉淀浆料。  20. Og mixture was stirred Japan K.K. AER0SIL silica powder ((registered trademark AER0SIL) 200 powder), 10. 02g Sachem K.K. tetrapropylammonium hydroxide 40% aqueous solution (product No. 746) , O. 0415g aqueous solution of aluminum sulfate hydrate · 14~18 (produced by Kanto chemical Co., Inc., Cat. No. 01186-00, deer special grade) is, 5. 28g O. 5mol / L sodium hydroxide solution (N / 2) (produced by Kanto chemical Co., Inc., Cat. No. 37848-08), a white precipitate slurry was prepared. 在80°C的干燥器中使该浆料干燥，得到白色固体。 In the manipulation dryer to 80 ° C the slurry was dried to give a white solid. 通过压缩成型该固体制成原料成型体，进行与实施例I的第I工序、第2工序、第3工序同样的操作，得到丙烯制造用催化剂E14。 The solid formed by compression molding the molded material, with a first step I of Example I, the second step, the same operation as the third step, to obtain the catalyst for producing the propylene E14. 在第I、第2工序中的碱金属/铝原子比、催化剂E14的Si/Al比、结晶度、羟基的峰位置、丙烯合成反应的效果在表2中汇总记载。 In Group I, the second step is an alkali metal / aluminum atomic ratio of the catalyst E14 Si / Al ratio, crystallinity, the peak position of the hydroxyl group, the synthesis reaction of propylene effects described are summarized in Table 2. 在60g日产化学工业株式会社生产的20%胶体二氧化硅（SN0WTEX N)的溶液中，边滴加90g氢氧化钠(和光纯药工业株式会社生产、Cat. No. 198-13765、试剂特级）的4mol/L水溶液，边进行搅拌混合，制备白色的沉淀凝胶。  In 60g Nissan Chemical Industries, Ltd. 20% colloidal silica (SN0WTEX N) was, added dropwise 90g of sodium hydroxide (Wako Pure Chemical Industries, Ltd., Cat. No. 198-13765, reagent grade) in 4mol / L aqueous solution while stirring and mixing, the white gel precipitate was prepared. 然后，加入20%硫酸水溶液直到沉淀凝胶分散液的pH达到6左右。 Then, 20% aqueous sulfuric acid was added until the pH of the gel precipitate dispersion liquid to about 6. 过滤分离沉淀，进行水洗，在110°C的干燥器中使之干燥一晚。 The precipitate was isolated by filtration, washed with water, dried in a dryer at 110 ° C in a manipulation of the night. 在硝酸铝水溶液中使得到的二氧化硅粉末含浸，然后，在110°C的干燥器中使之干燥一晚。 In an aqueous solution of aluminum nitrate impregnated silica powder obtained manipulation, and then dried in a dryer at 110 ° C in a manipulation of the night. 由压缩成型将粉末成型，以300°C烧制3小时，得到20. Og 二氧化硅-氧化铝载体，使用10. 02gSachem株式会社生产的四丙基氢氧化铵40%水溶液(制品编号746)载持四丙基铵成分，制成原料成型体。 Molding the powder by the compression molding, followed by baking at 300 ° C 3 hours to give 20. Og silica - alumina support, using tetrapropylammonium hydroxide 10. 02gSachem KK 40% aqueous solution (product No. 746) tetrapropylammonium carrying component made of molded material. 与实施例I的第I工序同样操作制成无粘合剂结晶硅酸铝成型体后，使用碳酸锶（Cs2CO3、和光纯药工业株式会社生产、Cat. No. 038-06545、和光一级）的水溶液，载持碳酸锶，进行与实施例I的第2工序、第3工序同样的操作，得到丙烯制造用催化剂E15。 I embodiment the first step in the same manner as Example I prepared binderless aluminosilicate crystals were molded using strontium carbonate (Cs 2 CO 3, Wako Pure Chemical Industries, Ltd., Cat. No. 038-06545, Wako a) aqueous solution, strontium carbonate supported, with the second step of Example I, the same operation as the third step, to obtain the catalyst for producing the propylene E15. 在第I、第2工序中的碱金属/铝原子比、催化剂E15的Si/Al比、结晶度、羟基的峰位置、丙烯合成反应的效果在表2中汇总记载。 In Group I, the second step is an alkali metal / aluminum atomic ratio, and E15 catalyst Si / Al ratio, crystallinity, the peak position of the hydroxyl group, the synthesis reaction of propylene effects described are summarized in Table 2. 在实施例I中，取代Sachem株式会社生产的四丙基氢氧化铵40%水溶液(制品编号746)使用等量的LION AKZO株式会社生产的四丙基氢氧化铵40%水溶液（品名TPAH-40)，不使用O. 5mol/L氢氧化钾溶液，除此以外，全部与实施例I同样操作，得到丙烯制造用催化剂E16。  In Example I, a substituted tetrapropylammonium hydroxide produced by Sachem Inc. 40% aqueous solution (product number 746) the same amount of tetrapropyl ammonium hydroxide produced by LION AKZO Co., Ltd. 40% aqueous solution (trade name TPAH-40), do not use O. 5mol / L potassium hydroxide solution, except that all the same manner as in Example I, to give a catalyst for producing the propylene E16. 此时，因为TPAH-40包含钾成分，所以在第2工序烧制前的固体的碱金属/铝原子比为21. 4。 At this time, because the composition comprises potassium TPAH-40, so the solid alkali metal prior to the second step of firing / aluminum atomic ratio of 21.4. 在第I、第2工序中的碱金属/铝原子比、催化剂E16的Si/Al比、结晶度、羟基的峰位置、丙烯合成反应的效果在表2中汇总记载。 In Group I, the second step is an alkali metal / aluminum atomic ratio of the catalyst E16 Si / Al ratio, crystallinity, the peak position of the hydroxyl group, the synthesis reaction of propylene effects described are summarized in Table 2. 在实施例5中，在第2工序的烧制前，载持使无粘合剂结晶硅酸铝成型体的碱金属/铝原子比成为20. O的量的氯化钾，除此以外，全部与实施例5同样操作，得到丙烯制造用催化剂E17。  In Example 5, prior to firing the second step, that the non-adhesive carrying an alkali metal crystalline aluminosilicate molded body / volume ratio becomes 20. O atom of aluminum chloride, in addition to other than this, all the same manner as in Example 5, to obtain the catalyst for producing the propylene E17. 组成分析的结果，原料成型体的碱金属/铝原子比为I. 5，在第2工序的碱金属成分存在下的烧制工序中的无粘合剂结晶硅酸铝成型体的碱金属/铝原子比为20. O。 Result of composition analysis, the alkali metal molded material / aluminum atomic ratio of I. 5, in the firing step of an alkali metal component of the second step is present in the adhesive-free crystalline aluminosilicate molded alkali / aluminum atomic ratio of 20. O. 催化剂E17的Si/Al比、结晶度、羟基的峰位置、丙烯合成反应的效果在表2中汇总记载。 The catalyst E17 Si / Al ratio, crystallinity, the peak position of the hydroxyl group, the effect of the propylene synthesis reaction described in Table 2 are summarized. 从在表2中记载的实施例12〜17的结果可知，在本发明的丙烯制造用催化剂的制造中，可以使用锂、钠、钾、铯的碱金属化合物。  From the results described in the Examples 12~17 in Table 2 shows that in manufacturing the catalyst, lithium, sodium, potassium, propylene production in the present invention, the alkali metal cesium compound. 另外可知，在使用铝酸钠时，通过并用其它碱金属成分，能够制造丙烯合成性能良好的催化剂。 Also found, when using sodium aluminate, and by using other alkali metal components, it is possible to manufacture the propylene synthesis catalyst performance. 实施例10、18〜20是研究在碱金属成分存在下的烧制温度影响的例子。  Example 10,18~20 is an example of the influence of the presence of an alkali metal component in the firing temperature studies. 反应试验与在表I中记载的实施例同样地进行。 Reaction Test Example described in Table I in the same manner. 在实施例10中，在空气气流中以300°C烧制载持有氯化钾的无粘合剂结晶硅酸铝成型体4小时，除此以外，全部与实施例10同样操作，得到丙烯制造用催化剂E18。  In Example 10, in an air stream at 300 ° C without firing potassium adhesive-carrying crystalline aluminosilicate molded body 4 hours, except that all the same manner as in Example 10 , to give a catalyst for producing the propylene E18. 组成分析的结果，Si/Al比为2525。 Result of composition analysis, Si / Al ratio of 2525. 红外分光分析的羟基的峰位置为3727. ScnT1。 Infrared spectroscopic analysis of the peak position of the hydroxyl group is 3727. ScnT1. 原料流通开始后第50小时的丙烯合成反应的效果为二甲醚转化率100. O %、丙烯收率38. 4c-mol%，性能良好。 Effects of 50 hours after the start of the feed flow of the propylene synthesis reaction DME conversion 100. O%, a propylene yield 38. 4c-mol%, good performance. 在实施例10中，在空气气流中以650°C烧制载持有氯化钾的无粘合剂结晶硅酸铝成型体4小时，除此以外，全部与实施例10同样操作，得到丙烯制造用催化剂E19。  In Example 10, in an air stream at 650 ° C without firing potassium adhesive-carrying crystalline aluminosilicate molded body 4 hours, except that all the same manner as in Example 10 , to give a catalyst for producing the propylene E19. 组成分析的结果，Si/Al比为2525。 Result of composition analysis, Si / Al ratio of 2525. 红外分光分析的羟基的峰位置为3729. OcnT1。 Infrared spectroscopic analysis of the peak position of the hydroxyl group is 3729. OcnT1. 原料流通开始后第50小时的丙烯合成反应的效果为二甲醚转化率100. O %、丙烯收率38. 9c-mol%，性能良好。 Effects of 50 hours after the start of the feed flow of the propylene synthesis reaction DME conversion 100. O%, a propylene yield 38. 9c-mol%, good performance. 在实施例10中，在空气气流中以200°C烧制载持有氯化钾的无粘合剂结晶硅酸铝成型体4小时，除此以外，全部与实施例10同样操作，得到丙烯制造用催化剂E20。  In Example 10, in an air stream at 200 ° C without firing potassium adhesive-carrying crystalline aluminosilicate molded body 4 hours, except that all the same manner as in Example 10 , to give a catalyst for producing the propylene E20. 组成分析的结果，Si/Al比为2525。 Result of composition analysis, Si / Al ratio of 2525. 红外分光分析的羟基的峰位置为3719CHT1。 Infrared spectroscopic analysis of the peak position of the hydroxyl group 3719CHT1. 原料流通开始后第50小时的丙烯合成反应的效果为二甲醚转化率96. 8%、丙烯收率29. 7c-mol%，稍差。 Effects of 50 hours after the start of the feed flow of the propylene synthesis reaction DME conversion 96.8%, the yield of propylene 29. 7c-mol%, somewhat less. 实施例16、21〜24、比较例1、2是由改变Si/Al比合成的丙烯制造用催化剂从二甲醚合成丙烯的反应的例子。  Example 16,21~24, Comparative Examples 1 and 2 is an example of changing from the reaction of propylene dimethyl ether synthesis catalyst Si / Al ratio of propylene for producing synthesis. 另外，实施例25是由MEL型晶体结构的催化剂的反应例。 Further, Example 25 is prepared from the reaction catalyst MEL type crystal structure. 比较例3是利用以在原料中使用水性反应浆料的现有方法合成的结晶硅酸铝的丙烯合成反应的例子。 Comparative Example 3 is an example of using the propylene synthesis reaction in a conventional method using an aqueous slurry reaction in the raw material synthetic crystalline aluminosilicate. 表3汇总了实施例和比较例催化剂的Si/Al比、晶体结构、结晶度、红外分光分析的羟基的峰位置和丙烯合成反应试验的结果。 Table 3 summarizes the results of the synthesis reaction test examples and comparative examples peak position of Catalyst Si / Al ratio, the crystal structure, crystallinity, infrared spectroscopy and hydroxyl groups of propylene. 反应试验与在表I中记载的实施例同样地进行。 Reaction Test Example described in Table I in the same manner. 在实施例16中，改变硝酸铝· 9水合物的使用量，将原料成型体的加料Si/Al比设为500、1000、1500、5000，除此以外，全部与实施例16同样操作，得到丙烯制造用催化剂(催化剂E21、催化剂E22、催化剂E23、催化剂E24)。  In Example 16, the change amount of aluminum nitrate 9-hydrate, the feed material molded Si / Al ratio is set 500,1000,1500,5000, except that in Example 16 with all of the same embodiment It was obtained in propylene production catalyst (catalyst E21, catalyst E22, E23, catalyst, catalyst E24). 组成分析的结果，丙烯制造用催化剂的Si/Al比分别为500、1000、1500、5000，与加料Si/Al比相同。 Result of composition analysis, Si / Al ratio of the catalyst for producing the propylene 500,1000,1500,5000 respectively, with feed Si / Al ratio of the same. 各催化剂的Si/Al比、晶体结构、结晶度、羟基的峰位置、丙烯合成反应的效果、丙烯/乙烯比（c-mol比)、丙烯/丙烷比(c-mol比）在表3中汇总记载。 Si each catalyst / Al ratio, the crystal structure, crystallinity, a peak position of the hydroxyl group, the effect of the propylene synthesis reaction, the propylene / ethylene ratio of (c-mol ratio), the propylene / propane ratio of (c-mol ratio) in Table 3 summary records. 在实施例16中，改变硝酸铝· 9水合物的使用量，将原料成型体的加料Si/Al比设为250，在进行第2工序的碱金属存在下的烧制前进行氯化钾的载持，将碱金属/铝原子比设为10.0，除此以外，全部与实施例16同样操作，得到丙烯制造用催化剂Cl。  In Example 16, the change amount of aluminum nitrate 9-hydrate, the feed material molded Si / Al ratio is set to 250, the alkali metal prior to firing the second step is performed in the presence of chlorine the supported potassium, alkali metal / aluminum atomic ratio is set to 10.0, except that all the same manner as in Example 16, to give a catalyst for producing the propylene Cl. 催化剂Cl的Si/Al比、晶体结构、结晶度、羟基的峰位置、丙烯合成反应的效果、丙烯/乙烯比（c-mol比)、丙烯/丙烧比（c-mol比）在表3中汇总记载。 Catalyst Cl, Si / Al ratio, the crystal structure, crystallinity, a peak position of the hydroxyl group, the effect of the propylene synthesis reaction, the propylene / ethylene ratio of (c-mol ratio), propylene / propylene burning ratio of (c-mol ratio) in Table 3 in summary records. 在实施例16中，不使用硝酸铝· 9水合物，除此以外，全部与实施例16同样操作，得到丙烯制造用催化剂C2。  In Example 16, instead of using aluminum nitrate 9-hydrate, except that all the same manner as in Example 16, to give a catalyst for producing the propylene C2. 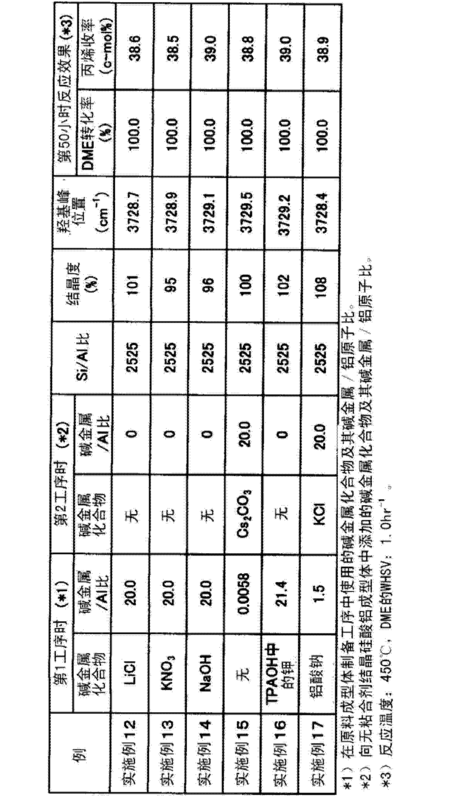 组成分析的结果，催化剂C2的Si/Al比为15000。 Result of composition analysis, Si / Al ratio of catalyst C2 was 15,000. 催化剂C2的Si/Al比、晶体结构、结晶度、羟基的峰位置、丙烯合成反应的效果、丙烯/乙烯比（c-mol比)、丙烯/丙烧比（c-mol比）在表3中汇总记载。 Si catalyst C2 / Al ratio, the crystal structure, crystallinity, a peak position of the hydroxyl group, the effect of the propylene synthesis reaction, the propylene / ethylene ratio of (c-mol ratio), propylene / propylene burning ratio of (c-mol ratio) in Table 3 in summary records. O. 5L)，以温度105°C、96小时、在自生压力下加热处理在该溶液中添加IOml的O. 26g硝酸铝·9水合物的水溶液而得到的水性浆料。 O. 5L), at a temperature of 105 ° C, 96 hours under autogenous pressure in an aqueous solution of the heat treatment O. 26g of aluminum nitrate 9-hydrate added IOml of the solution obtained in aqueous slurry. 离心分离得到的白色浆料，得到白色沉淀。 The resulting white slurry was centrifuged to give a white precipitate. 在沉淀中加水，反复离心分离、清洗直到上清液的PH为7。 The precipitate with water, centrifuged again, the supernatant was washed until PH 7. 以80°C干燥一晚后，在空气气流中以600°C烧制4小时，得到15. Ig白色粉末。 After drying at 80 ° C overnight, fired in an air stream for 4 hours to 600 ° C, to give a white powder 15. Ig. 从在原料的四乙氧基硅烷和硝酸铝· 9水合物中包含的硅和铝的量计算得到理论产量，白色粉末收率为理论产量的72重量％。 Theoretical yield calculated from the amount of aluminum and silicon contained in tetraethoxysilane and aluminum nitrate 9-hydrate in the raw material, as a white powder in a yield of 72% by weight of the theoretical yield. 与实施例I的阳离子交换工序同样地进行铵离子交换、烧制，得到催化剂C3。 For ammonium ion exchange with the cation exchange step the same manner as Example I, fired to obtain a catalyst C3. 粉末X射线衍射的结果，结晶度为111%，可知催化剂C3是结晶性良好的MFI型结晶硅酸铝。 The results of powder X-ray diffraction crystallinity of 111%, C3, the catalyst is a crystalline MFI-type crystalline aluminosilicate good. 组成分析的结果，Si/Al比为500。 Result of composition analysis, Si / Al ratio of 500. 在丙烯合成反应试验中，使用相对于催化剂C3的重量利用20重量％的触媒化成生产的氧化铝溶胶、Cataloid-AP进行成型后并经过烧制、造粒得到的催化剂。 In the propylene synthesis reaction test using an alumina sol by weight relative to the catalyst C3 using a 20% by weight of the catalyst into production, Cataloid-AP after the catalyst is molded, and after firing, the resulting granulated. 催化剂C3 的Si/Al比、晶体结构、结晶度、羟基的峰位置、丙烯合成反应的效果、丙烯/乙烯比（c-mol比)、丙烯/丙烧比（c-mol比）在表3中汇总记载。 Catalyst C3 is Si / Al ratio, the crystal structure, crystallinity, a peak position of the hydroxyl group, the effect of the propylene synthesis reaction, the propylene / ethylene ratio of (c-mol ratio), propylene / propylene burning ratio of (c-mol ratio) in Table 3 in summary records. 从实施例16、21〜24、比较例1、2的结果可知，相比于Si/Al比小于500的催化齐U，无粘合剂结晶硅酸铝成型体的Si/Al比为500〜1000范围内的MFI型、MEL型晶体结构的丙烯制造用催化剂在丙烯合成反应中的乙烯、丙烷等链烷烃的生成量少，丙烯收率、丙烯/丙烷比（c-mol比)优异。  16,21~24, the results can be seen from Comparative Examples 1 and 2 embodiment, compared to the Si / Al ratio of less than 500 homogeneous catalyst U, binderless crystalline aluminosilicate molded Si / Al ratio an MFI type, MEL type crystal structure producing a propylene in the propylene synthesis reaction to generate a small amount of ethylene, propane, alkanes, propylene yield, propylene / propane ratio of (c-mol ratio) of the catalyst in the range of 500~1000 excellent. 比较例3是合成Si/Al比为500的MFI型结晶硅酸铝粉末的例子，但因为在成型中使用的氧化铝粘合剂成分，所以丙烯合成反应的效果差。 Comparative Example 3 is an example of the synthesis of Si / Al ratio of the MFI-type crystalline aluminosilicate powder 500, but because the alumina binder component used in the molding, so the effect of the difference in the propylene synthesis reaction. 使用实施例16的催化剂E16，以重量空间速度（WHSV) 2. Ohf1供给二甲醚的气体，在温度550°C、大气压下进行反应试验。 The catalyst of Example 16 E16  Using embodiments, the feed gas of dimethyl ether at a weight space velocity (WHSV) 2. Ohf1, reaction was carried out at the test temperature 550 ° C, atmospheric pressure. 反应气体组成中，将二甲醚/氮气体积比设为60/40。 The reaction gas composition, the dimethyl ether / nitrogen volume ratio was set to 60/40. 在表4中表示第100小时、第500小时、第1000小时的各成分收率、丙烯/乙烯比(c-mol比)、丙烯/丙烷比（c-mol比）。 Represents 100 hours in Table 4, the first 500 hours, the yield of each component for 1,000 hours, the propylene / ethylene ratio of (c-mol ratio), the propylene / propane ratio of (c-mol ratio). 催化剂E16即使进行1000小时反应，二甲醚收率也为99%以上，丙烯收率也为42%，良好。 The catalyst even after 1000 hours the reaction E16, DME yield is 99% or more, 42% yield of propylene but also good. 使用实施例16的催化剂E16，以重量空间速度（WHSV) 2. 4hr^供给甲醇，在温度550°C、大气压下进行反应试验。 The catalyst of Example 16 E16  Using embodiments, a weight space velocity (WHSV) 2. 4hr ^ methanol feed, the reaction temperature of the test at 550 ° C, atmospheric pressure. 反应气体组成中，将甲醇/氮气体积比设为75/25。 The reaction gas composition, a methanol / nitrogen volume ratio was set to 75/25. 反应第500小时的甲醇转化率为10. 0%，丙烯收率为46. 8%，丙烯/乙烯比（c-mol比)为13. 4、丙烯/丙烷比（c-mol 为707，与在原料中使用二甲醚时为同等以上的效果。 The reaction of 500 hours was 10.0% methanol conversion, the propylene yield was 46.8%, the propylene / ethylene ratio of (c-mol ratio) was 13.4, the propylene / propane ratio of (c-mol to 707, and when dimethyl ether in the feedstock is at least the same effect. 使用实施例16的催化剂E16，以重量空间速度（WHSV) I. Ohr—1供给1_ 丁烯，在温度500°C、大气压下进行反应试验。 The catalyst of Example 16 E16  Using embodiments, a weight space velocity (WHSV) I. Ohr-1-butene 1_ supplied, the test reaction at a temperature of 500 ° C, atmospheric pressure. 反应气体组成中，将I- 丁烯/氮气体积比设为50/50。 The reaction gas composition, the I- butene / nitrogen volume ratio was set to 50/50. 在表5中汇总反应第24小时的反应管出口气体组成。 Summarized in Table 5. The reaction at 24 hours the reaction tube outlet gas composition. 实施例29 在实施例28中，取代I- 丁烯使用I-己烯，除此以外，全部与实施例28同样地进行。 Example 29   In the Example 28, instead of using I- I- butene hexene, except that all the same manner as in Example 28. 在实施例28中，取代I-丁烯使用乙烯，除此以外，全部与实施例28同样地进行。  In Example 28, an ethylene-butene substituted I-, except that all the same manner as in Example 28. 可知在本发明的丙烯制造用催化剂中，乙烯几乎不发生反应。 In the known manufacture of propylene with the catalyst of the present invention, ethylene is produced almost no reaction. 使用实施例16的催化剂E16，供给反应气体组成(体积％)为二甲醚/乙烯/异丁烯/水=46/3/6/45的混合原料，在温度550°C、大气压下进行反应试验。 The catalyst E16  Example 16 using the supplied reaction gas composition (vol.%) Mixed feed DME / ethylene / isobutene / water = 46/3/6/45, at a temperature of 550 ° C, atmospheric pressure reaction test. 二甲醚的WHSV设为I. Ohr—1，异丁烯的WHSV设为O. 16hr^0在表6中汇总反应第24小时的反应管出口气体组成。 DME WHSV set I. Ohr-1, isobutene WHSV to O. 16hr ^ 0 Summary 24 hours of reaction the reaction tube outlet gas composition in Table 6. 二甲醚的转化率为100.0%，丙烯收率为47. 5%，与仅以二甲醚为原料的实施例26 相同。 DME conversion was 100% and the propylene yield was 47.5%, the same as in Example DME as a raw material of only 26. 使用实施例16的催化剂E16，供给反应气体组成(体积％)为甲醇/乙烯/I-丁烯=91/3/6的混合原料，在温度550°C、大气压下进行反应试验。 The catalyst E16  Example 16 using the supplied reaction gas composition (vol%) mixed raw material methanol / ethylene / butylene = the I-91/3/6, the reaction was carried out at the test temperature 550 ° C, atmospheric pressure. 甲醇的WHSV设为2. Ohf1，异丁烯的WHSV设为O. 23hr'在表6中汇总反应第24小时的反应管出口气体组成。 WHSV is defined as methanol 2. Ohf1, isobutene WHSV to O. 23hr 'summary of the reaction at 24 hours the reaction tube outlet gas composition in Table 6. 甲醇的转化率为100. O%，丙烯收率为47. 2%，与仅以甲醇为原料的实施例27相同。 Conversion of methanol 100. O%, the propylene yield was 47.2%, the same as in Example 27 only methanol as a raw material. 1. 一种丙烯制造用催化剂，其特征在于： 其用于从选自甲醇、二甲醚和碳原子数为4〜8的烯烃中的I种或2种以上制造丙烯，该催化剂由硅/铝原子比为500〜10000的无粘合剂结晶硅酸铝成型体构成，结晶硅酸铝包含MFI型的晶体结构和/或MEL型的晶体结构。 A catalyst for producing propylene, comprising: for from selected from methanol, dimethyl ether and carbon atoms, or two or more kinds I for producing a propylene-olefin of 4 to 8, and the catalyst consists of a silicon / aluminum atomic ratio of the crystalline aluminosilicate 500~10000 binderless molded configuration comprising a crystalline aluminosilicate of the MFI type crystal structure and / or MEL type crystal structure. 2.如权利要求I所述的丙烯制造用催化剂，其特征在于： 通过红外分光分析，在3715CHT1至3735CHT1的范围内所观察到的无粘合剂结晶硅酸铝成型体的羟基的峰位置在3725CHT1至3735CHT1的范围内。 2. I for producing propylene according to claim catalyst, wherein: By infrared spectroscopic analysis, observed in the range 3715CHT1 to 3735CHT1 binderless crystalline aluminosilicate molded hydroxyl peak position in 3725CHT1 to the range of 3735CHT1. 3.如权利要求I或2所述的丙烯制造用催化剂，其特征在于： 结晶硅酸铝为MFI型晶体结构和/或MEL型晶体结构。 I or 2 for producing propylene claim catalyst, characterized in that: crystalline aluminosilicate is an MFI type crystal structure and / or MEL type crystal structure. 4.如权利要求I〜3中任一项所述的丙烯制造用催化剂，其特征在于：结晶硅酸铝的阳离子型为质子型或铵离子型。 As claimed in claim I~3 4. propylene production as claimed in any one catalyst, characterized in that: crystalline aluminosilicate cationic proton type or ammonium ion type. 5. 一种制造丙烯的方法，其特征在于： 在权利要求I〜4中任一项所述的丙烯制造用催化剂的存在下，从选自甲醇、二甲醚和碳原子数为4〜8烯烃中的I种或2种以上制造丙烯。 5. A method for producing propylene, comprising: producing propylene according to any one of claims I~4 with the presence of a catalyst, from dimethyl ether and methanol selected number of 4 to 8 carbon atoms, I or two or more kinds of olefins in the production of propylene. 6. 一种丙烯制造用催化剂的制造方法，其特征在于： 该丙烯制造用催化剂由硅/铝原子比为500〜10000的无粘合剂结晶硅酸铝成型体构成，结晶硅酸铝包含MFI型的晶体结构和/或MEL型的晶体结构， 该制造方法包括转化工序，其中，使由包含硅成分、铝成分和结构导向剂成分的固体成分构成的原料成型体接触包含饱和水蒸气的气氛，将硅成分和铝成分转化为结晶硅酸铝。 A propylene production, characterized in that the method for producing a catalyst: The catalyst for producing propylene from a silicon / aluminum atomic ratio of 500~10000 binderless crystalline aluminosilicate molded configuration comprising a crystalline aluminosilicate MFI crystal structure and / or MEL type crystal structure type, the method comprising transforming step, wherein the atmosphere containing the silicon component from the molded body in contact with the solid material component and the aluminum component of the structure directing agent is comprised of saturated steam the silicon component and the aluminum component to crystalline aluminosilicate. 7.如权利要求6所述的丙烯制造用催化剂的制造方法，其特征在于：包括烧制工序，其中，在碱金属的存在下，对所述转化工序中得到的转化产物进行烧制。 7. The propylene production method of claim 6 for producing a catalyst, which is characterized in that: a firing step, wherein, in the presence of an alkali metal, conversion of the conversion products obtained in the firing step. 8.如权利要求7所述的丙烯制造用催化剂的制造方法，其特征在于：在所述烧制工序中，在碱金属/铝原子比为4〜200范围内的碱金属的存在下，对所述转化产物进行烧制。 8. propylene according to claim 7 for producing a method for producing a catalyst, which is characterized in that: in the baking step, the alkali metal / aluminum atomic ratio of presence of alkali metal in the range of 4~200, for the conversion products firing. 9.如权利要求7或8所述的丙烯制造用催化剂的制造方法，其特征在于：包括离子交换工序，其中，将在所述烧制工序得到的烧制体中的碱金属进行离子交换，制成质子型或铵离子型的无粘合剂结晶硅酸铝成型体。 9. The propylene production 7 or claim 8 method for producing a catalyst, characterized by: a step of ion exchange, wherein the alkali metal in the fired body obtained in the sintering step of ion exchange, made of a proton-type or ammonium ion type binderless crystalline aluminosilicate molded.